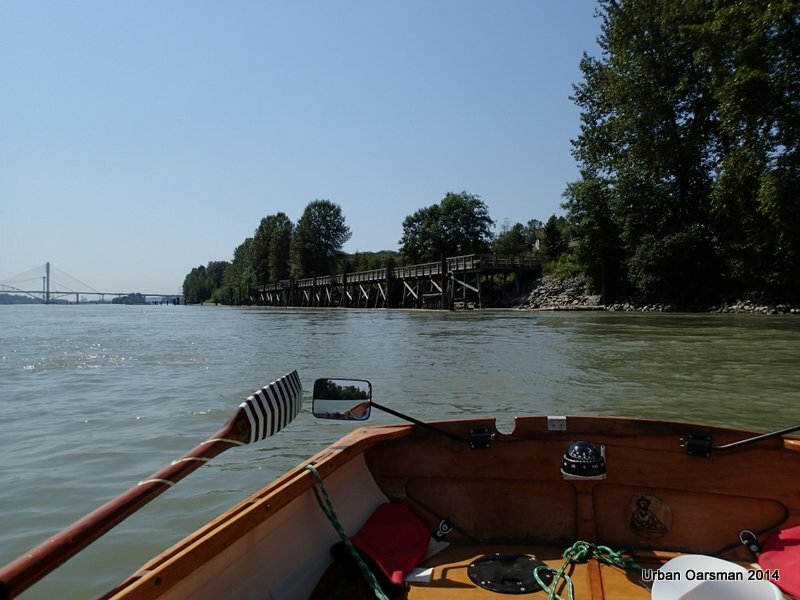 Baking in the Summer Sun, The Pitt River Row. The “Low-high” water was at approximately 7am, PST. The “Low-low” water is around 4pm PST. Widgeon Creek is about two and a half hours behind the gauge. I am expecting high water around 9:30 am PST (10:30 local or daylight savings time), with the water level falling until 4 or 5pm. 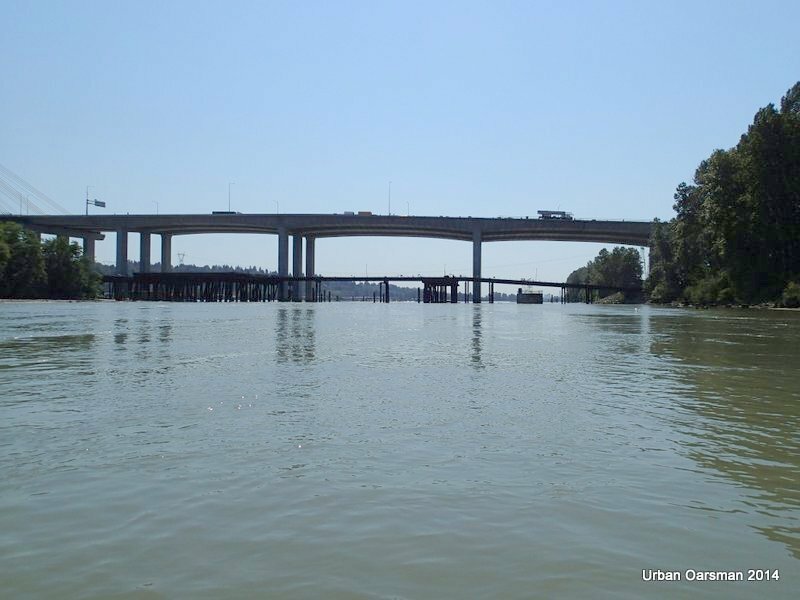 The link to the river level site is: http://www.wateroffice.ec.gc.ca/index_e.html . Gwragedd Annwn and I are being dropped off at the Grant Narrows Boat launch. My son will pick me up at the end of the row. 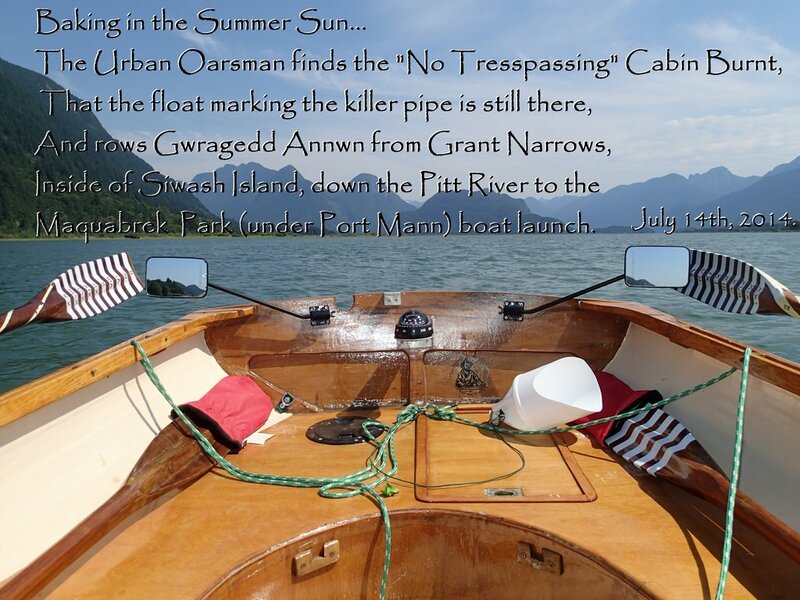 I will row across Grant Narrows to Widgeon Creek to check the depth gauge in front of the “No-trespassing” cabin, then over to see if the float I put on to mark the pipe that I had run into is still there. 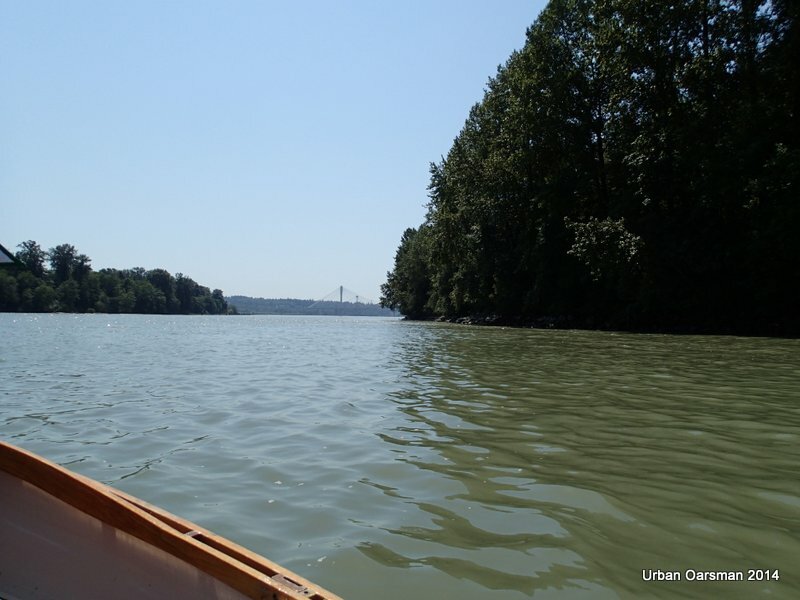 I will then row down Widgeon Slough, (the channel between Siwash Island and the west bank), re-enter the Pitt and row down to the boat launch under the Port Mann Bridge for pick-up. Launching Gwragedd Annwn. Paul is driving away and will pick me up at the end of the Row. I will phone him and tell him where and when to pick me up. 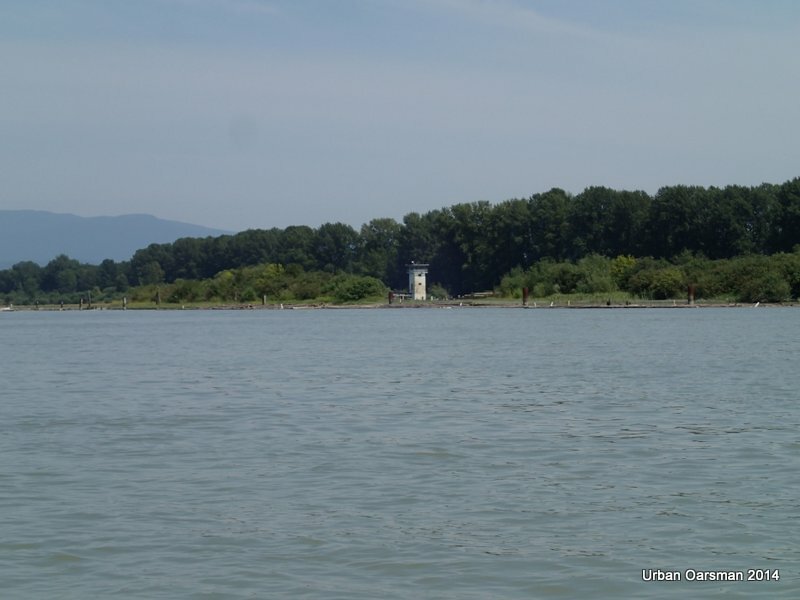 Entering Widgeon Creek Estuary. The “No power boats” sign. There is almost no wind and the water is flat, flat, flat. Two kayaks are ahead of me. 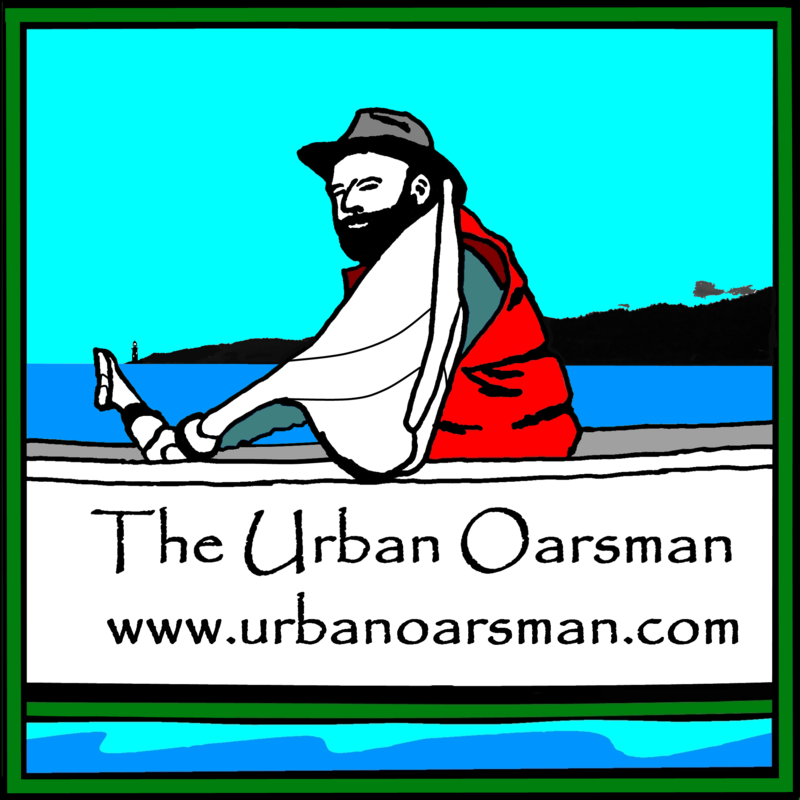 Two kayaks are astern of me. 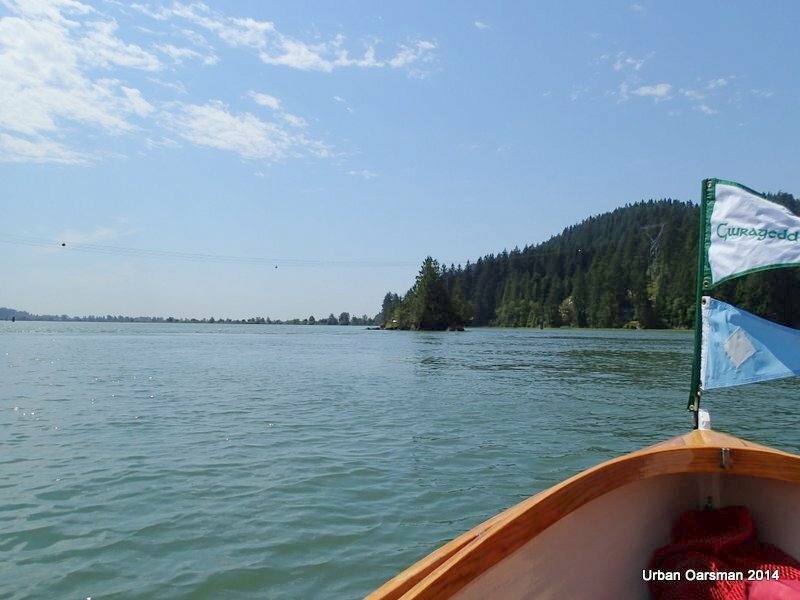 I continue rowing upstream toward the depth gauge. 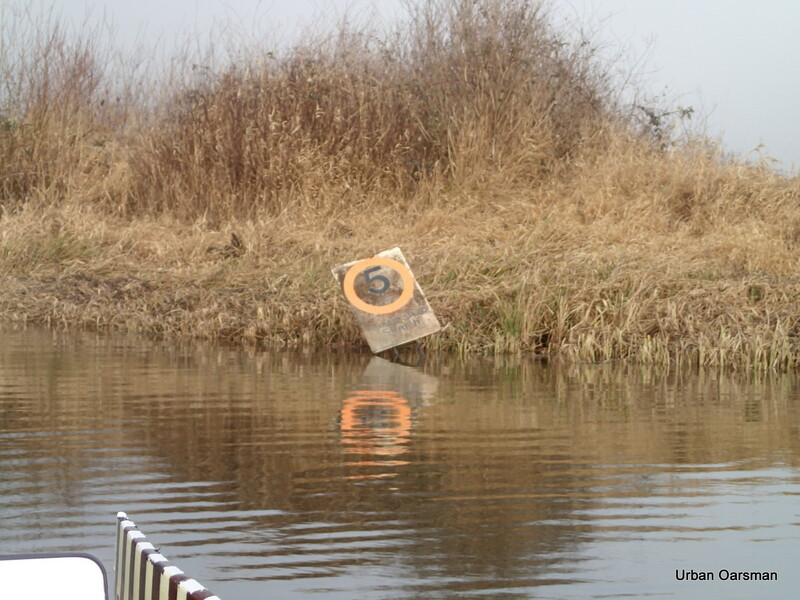 The depth marker gauge. I have never see the water this high here. Well over the 7 foot mark. 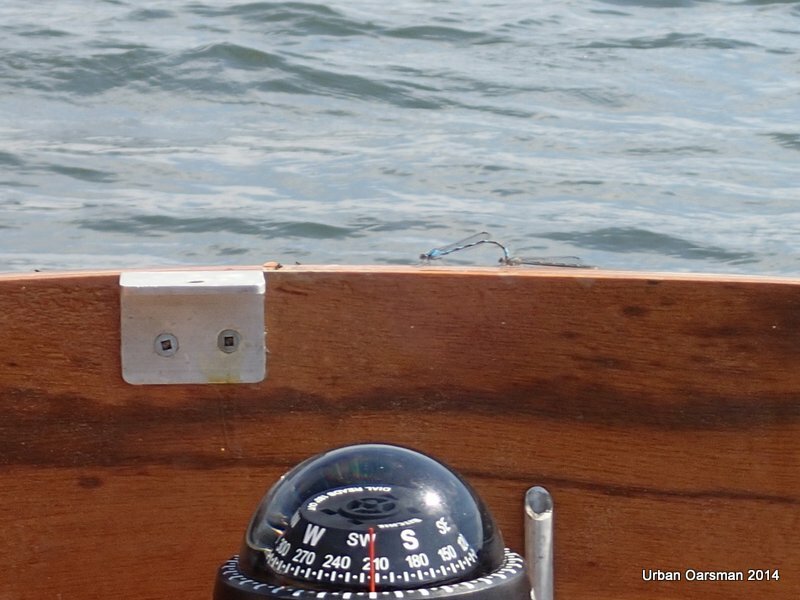 I row over the gauge. Probably 8 feet of water. 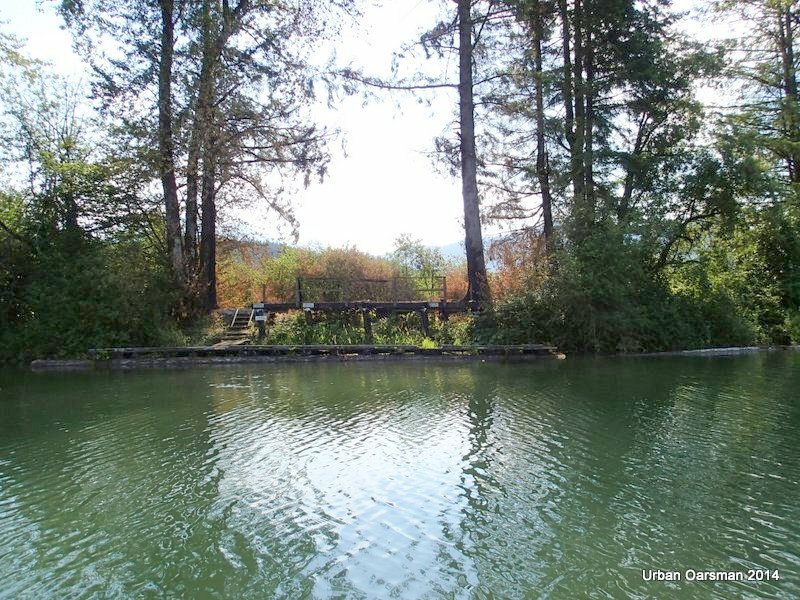 All of the Kayakers are as surprised as I am that the cabin is gone. 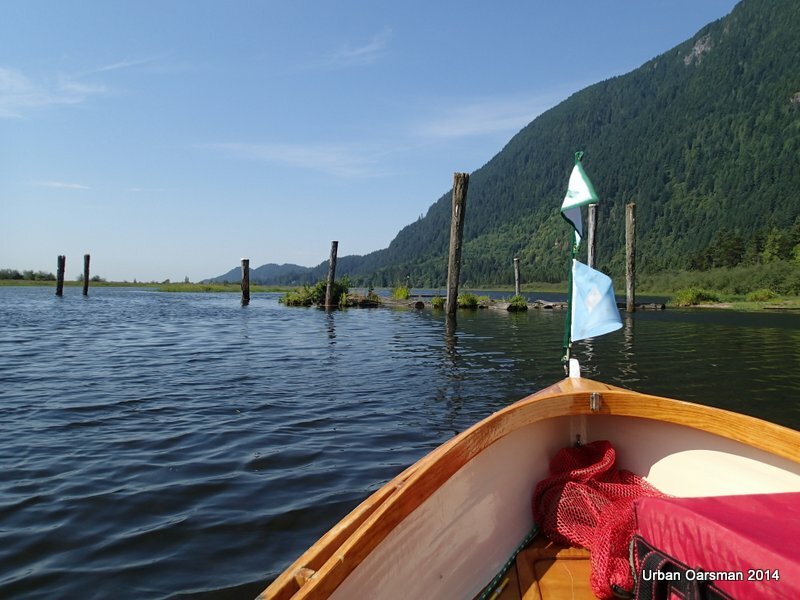 I row toward Widgeon Slough, the channel between Siwash Island and the west bank. 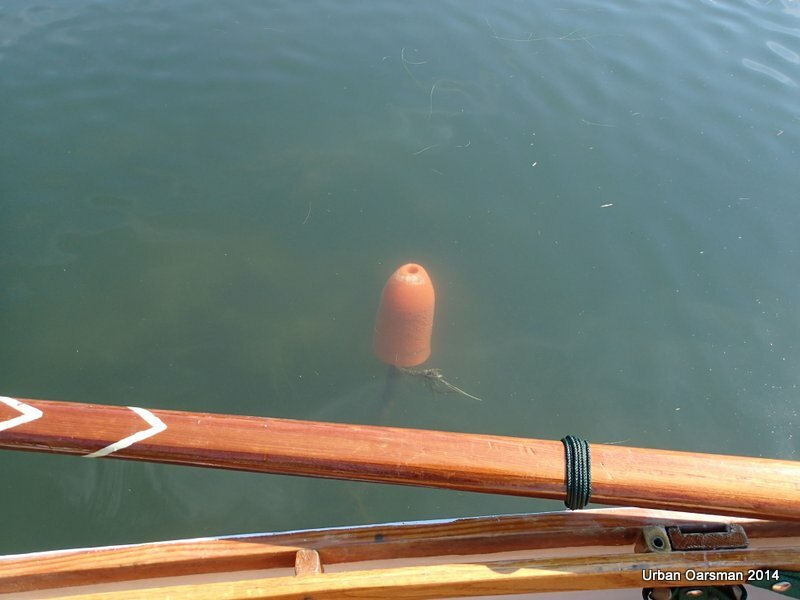 I find the orange float on the end of the pipe. I hammered it onto the pipe on June 23rd, 2014. Good to see that it is still there on the business end of the pipe. Another look at the float. 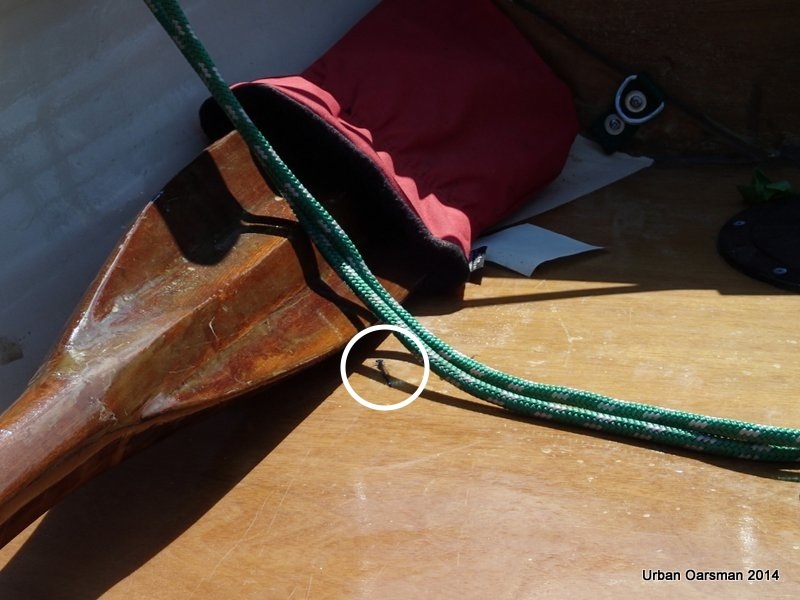 At least if you run into it now, the float will prevent the pipe from scratching or penetrating your hull. The pipe before I hammered the float on to it’s end. The pipe after it I “Belled” it with the float. 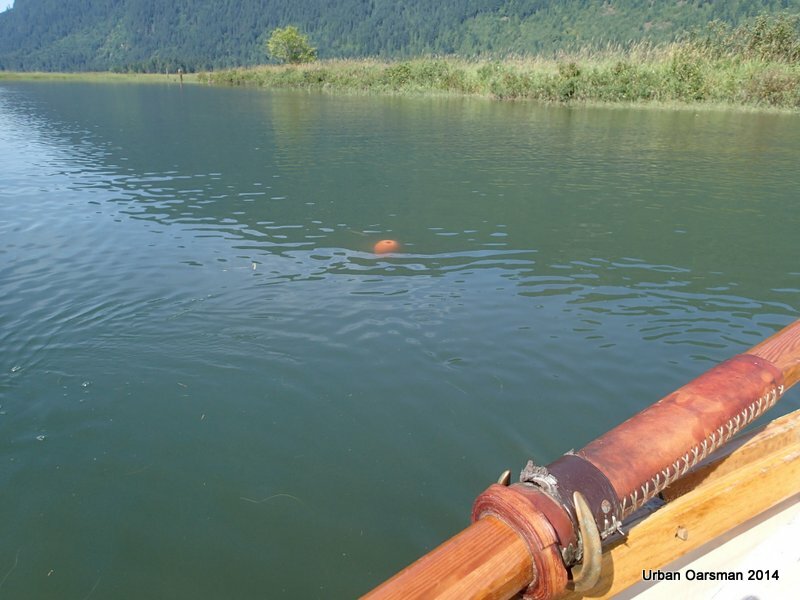 I row past the pipe hazard now marked with an orange float, South into Widgeon Slough, the channel between Siwash Island and the Western shore. The reeds in the channel point into the channel, indicating that the tide is still coming in at this point (9:21am). Google Earth image of the first leg of the row. A dragonfly hitching a ride away from the wind. 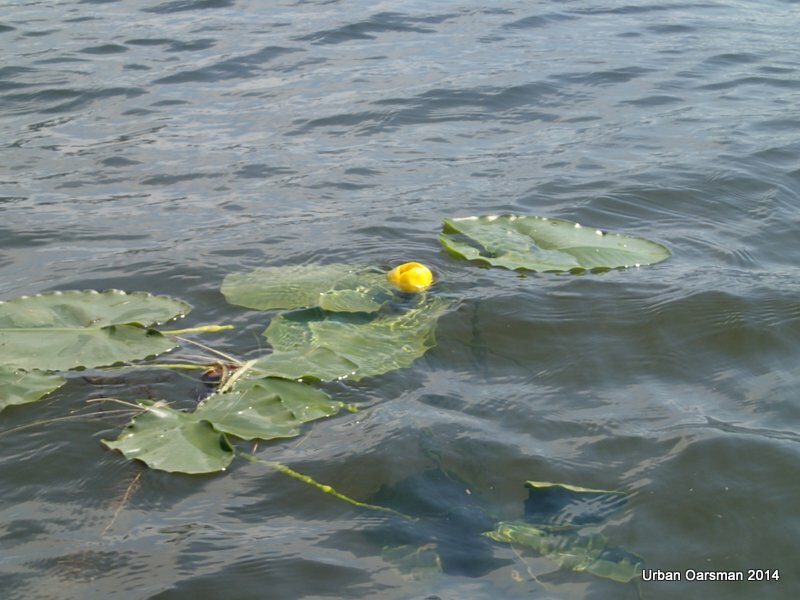 There are a lot of Indian pond lilies (Nymphaeaceae) in the channel. More hitch-hikers. The wind is blowing more than 10km/hr now. 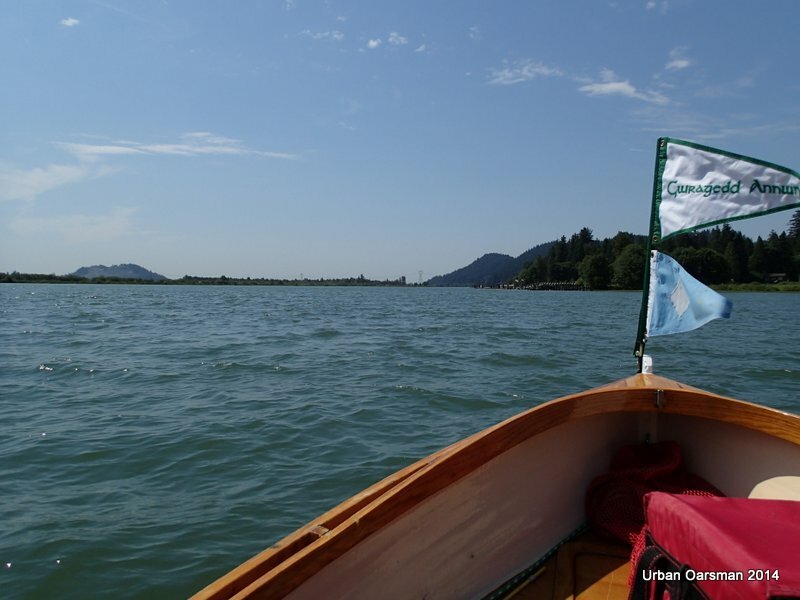 Rowing into the wind. I am making about 2km/hr headway here. The view North, rowing into the wind. 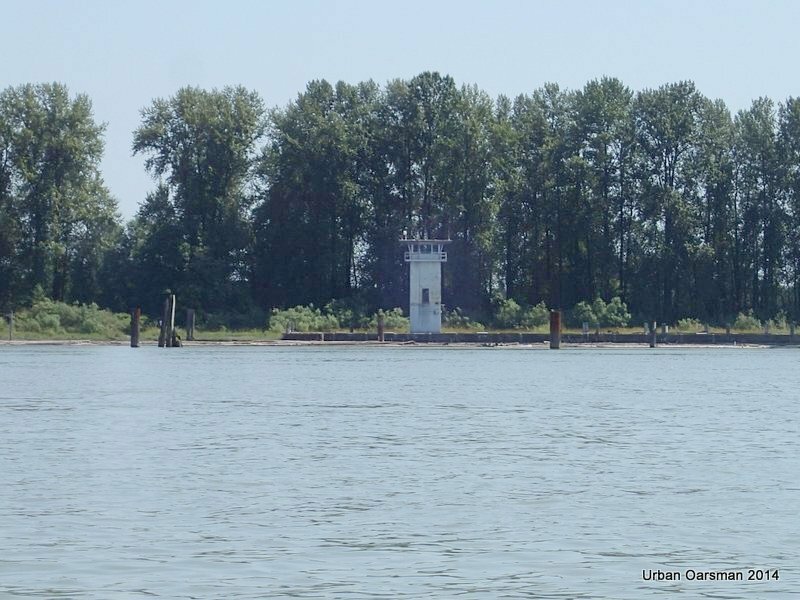 Siwash Island to the East (right). 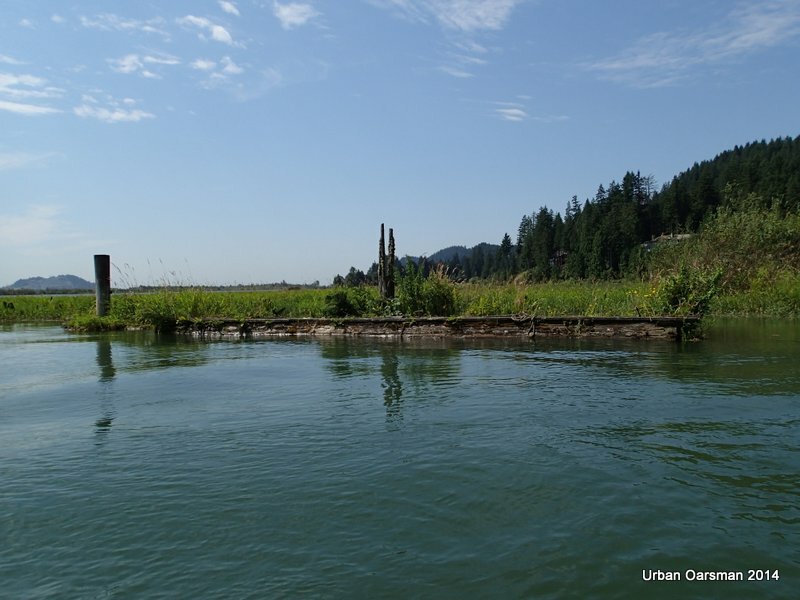 A floating Dock on the West bank, in Widgeon Slough, the channel between Siwash Island and the west bank of Pitt River. 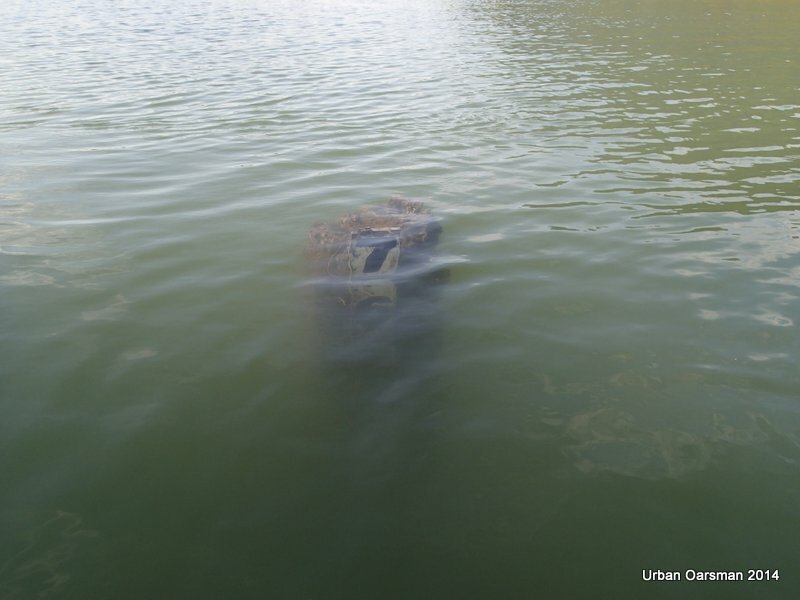 The water is so high that the speed limit sign is submerged. This is what the sign looked like when I was here on January 18th, 2014. I row out into the middle of Fox Reach. 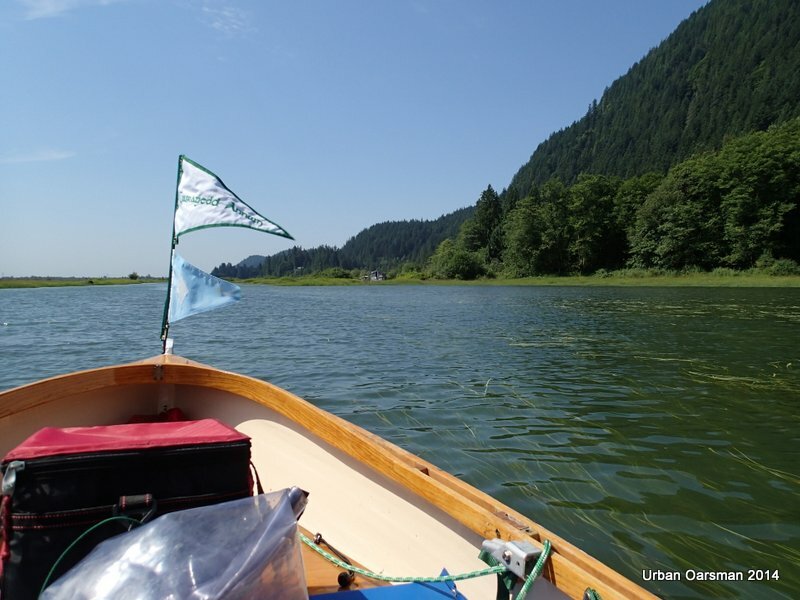 Rowing plan “B”: If the wind is too strong it will push Gwragedd Annwn back towards Grant Narrows, and I will row back up river, circumnavigate Siwash Island and explore more of Widgeon Creek with the high water. 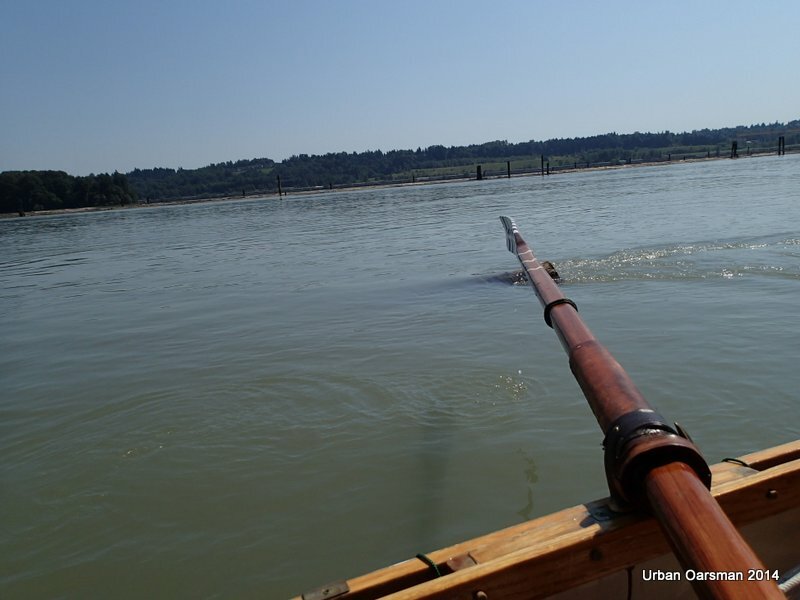 Rowing “Plan “A”: If the current flowing downstream has a stronger effect on Gwragedd Annwn and she goes downstream with the current, I will continue on and row to the Port Mann boat launch. Even with the 10+ km/hr breeze, Gwragedd Annwn is moving with the current downstream between 2 and 3 km/hr. 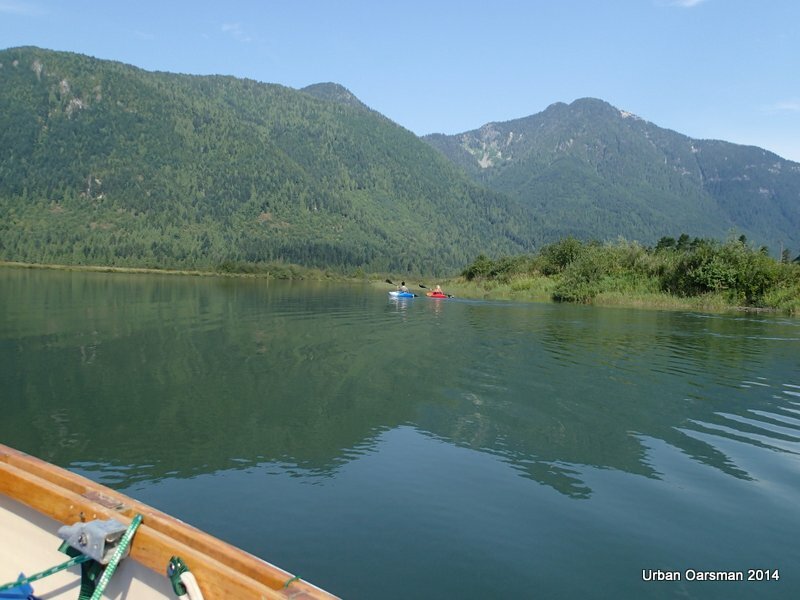 With rowing, I can make a boat speed of 2 to 3 km/hr through the water, giving me an over the ground speed of between 5 and 6 km/hr. 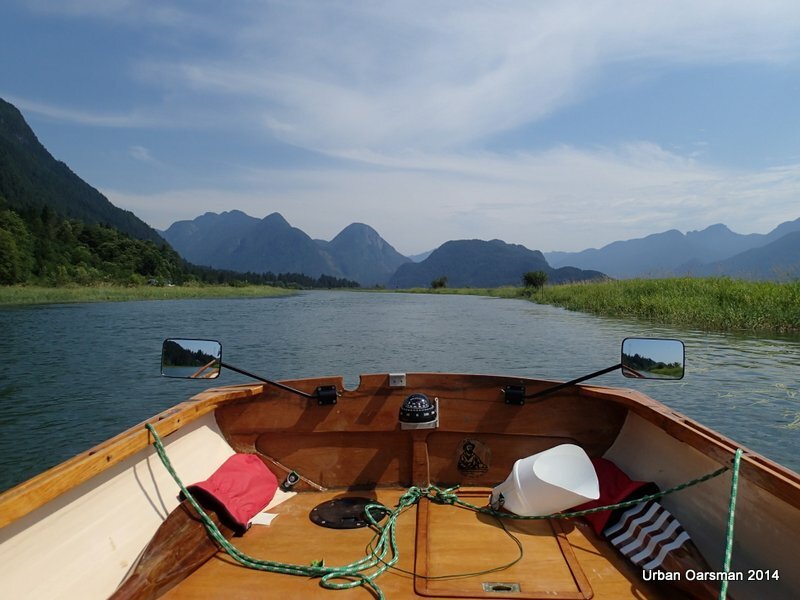 I opt for plan “A” and row down river. 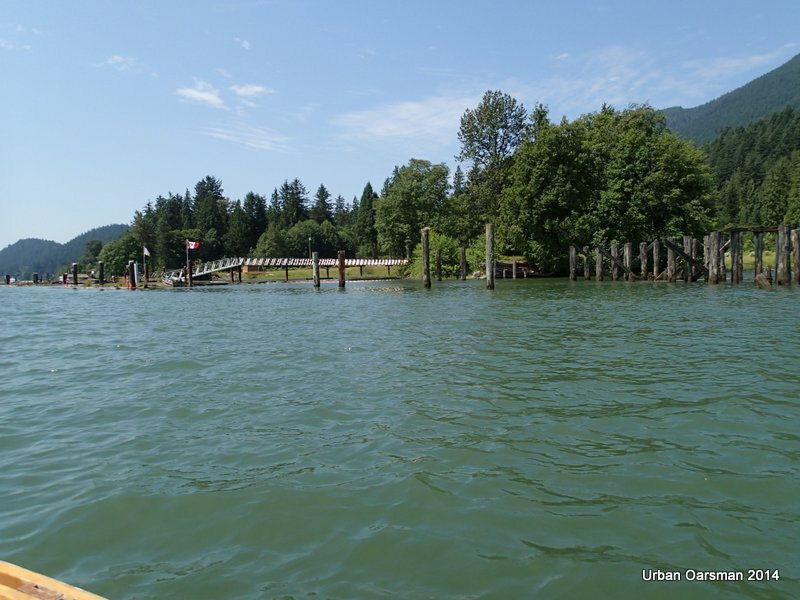 Private docks on the west bank of the Pitt River by Munro Creek. The second leg of the Row. 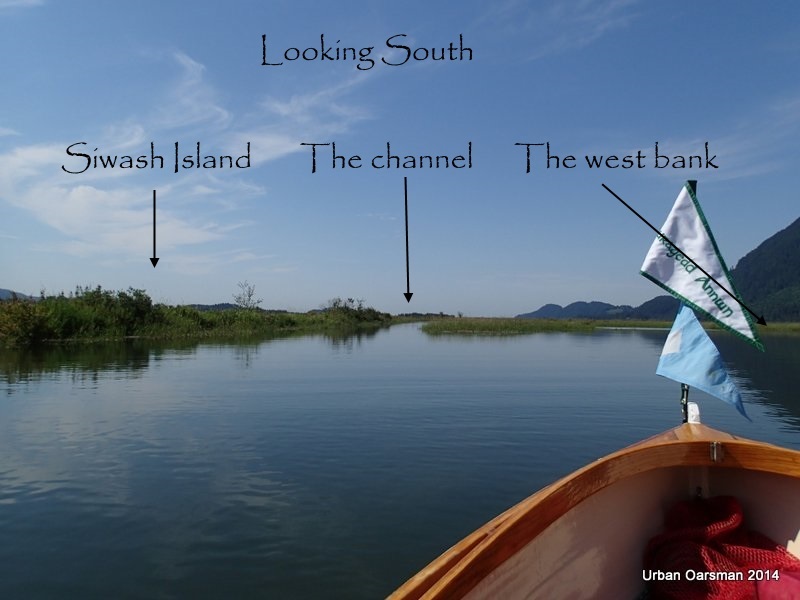 The chart shows the unnamed islet is 14 meters high. River side view of the Quarry. It is still active. 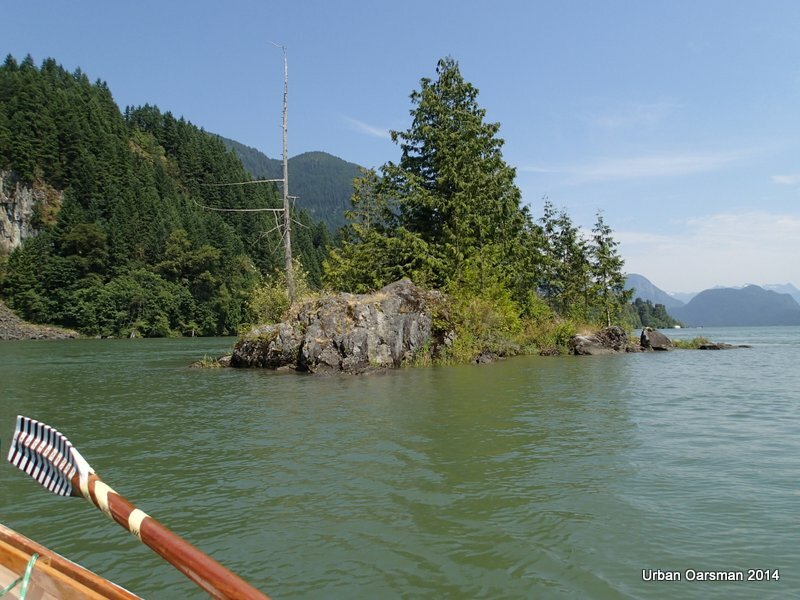 The islet appears. There is 22 meters of clearance under the power lines. 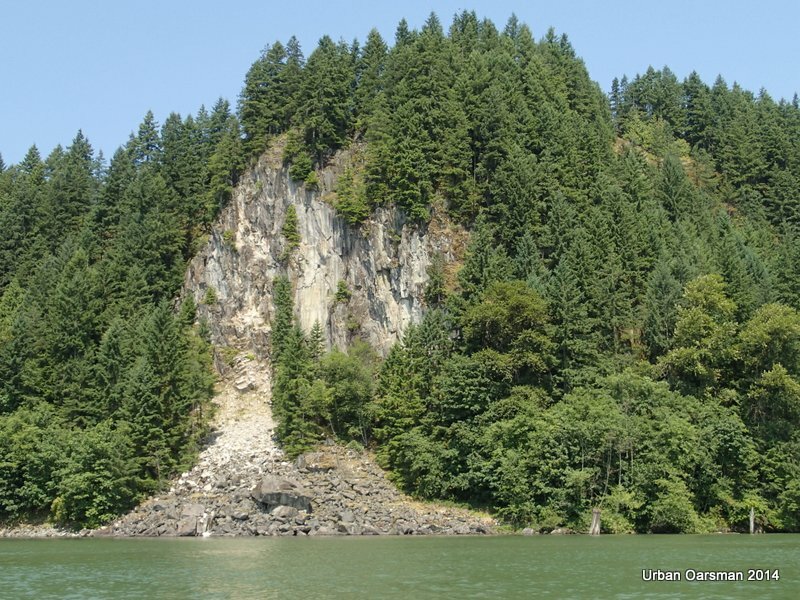 Cliff face at MacIntyre Creek, North side. Leaving the islet astern. 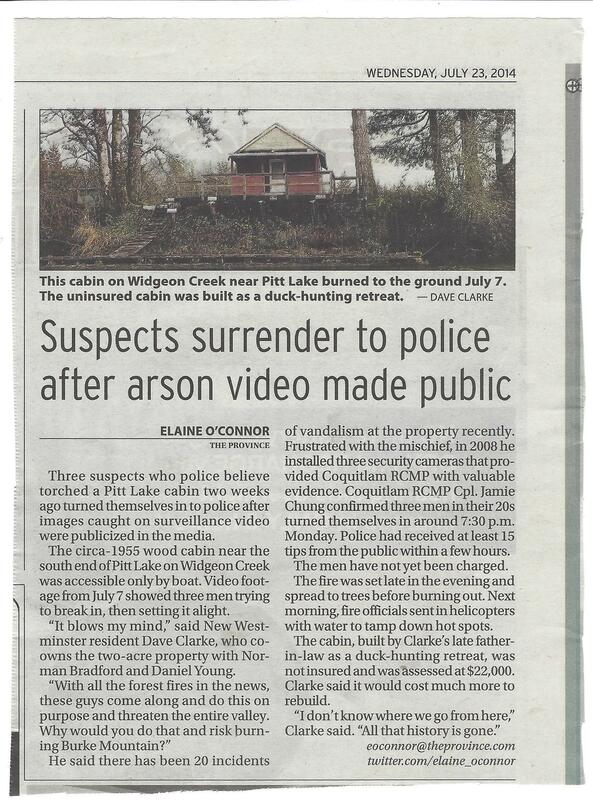 I saw a camp-fire pit on the islet as I passed. Could be an interesting place to camp for the night. It is getting hotter. One liter of water drunk. 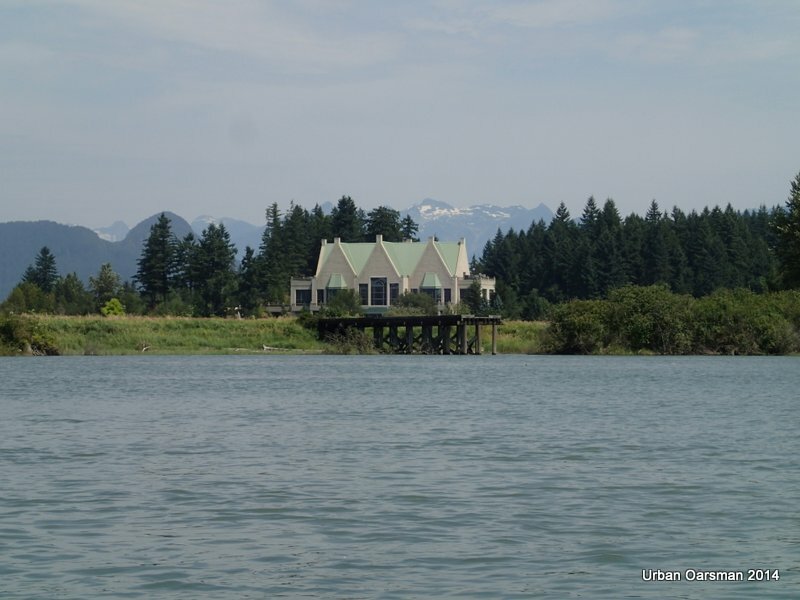 Swaneset Bay Resort & Country Club as seen from the river. 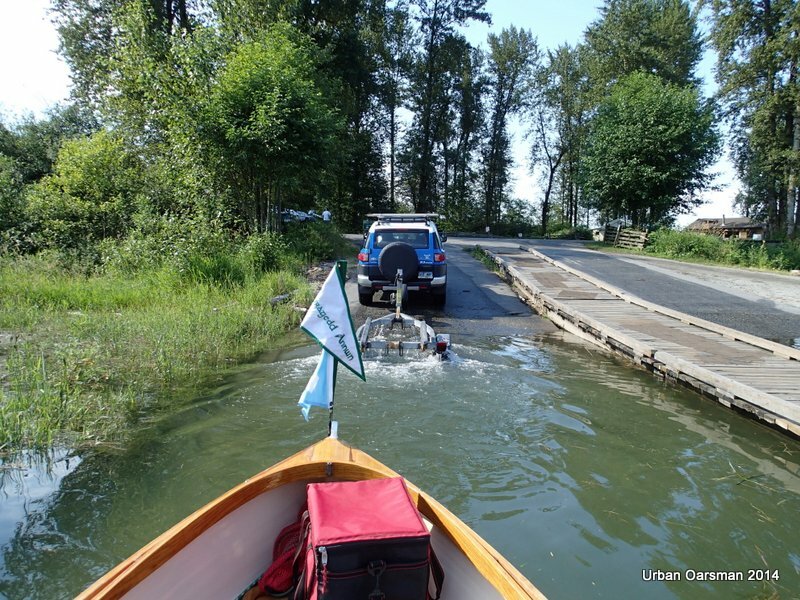 As you are driving to Grant Narrows Boat Launch, the good pavement ends just past the entrance to the club. 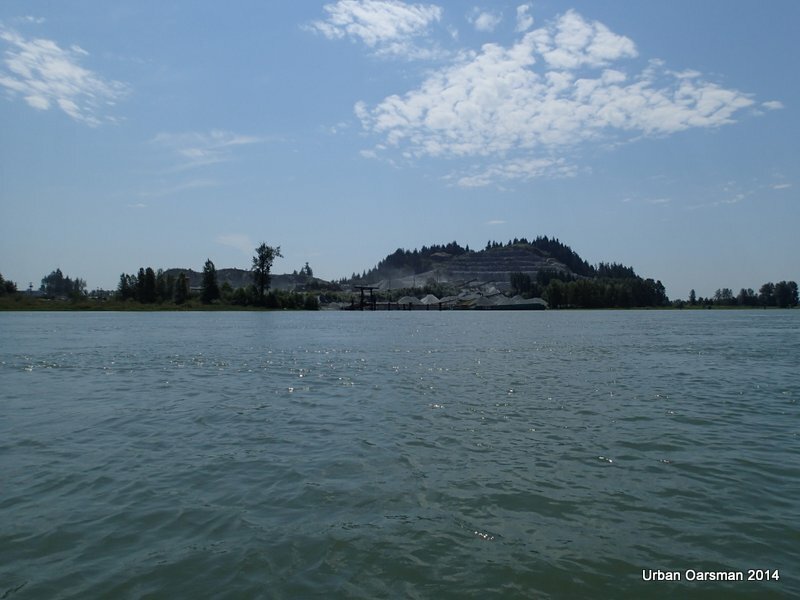 Just past Addington Point on the west shore, Pitt River Quarries as seen from Pitt River. The Quarry is very noisy when the machinery is running. I feel sorry for the Swaneset Bay Resort & Country Club members. Such nice pavement to the club and then all of this noise. Maybe the quarry does not run on the weekends. Third leg of the Row and time for lunch. 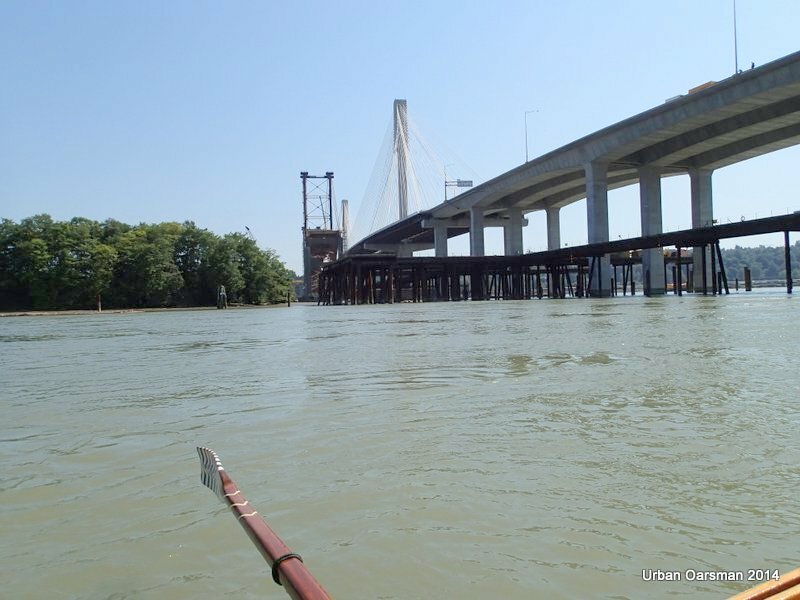 I have a sandwich and a bottle of iced tea as I drift down river past Addington Point. Looking North at Addington marsh. 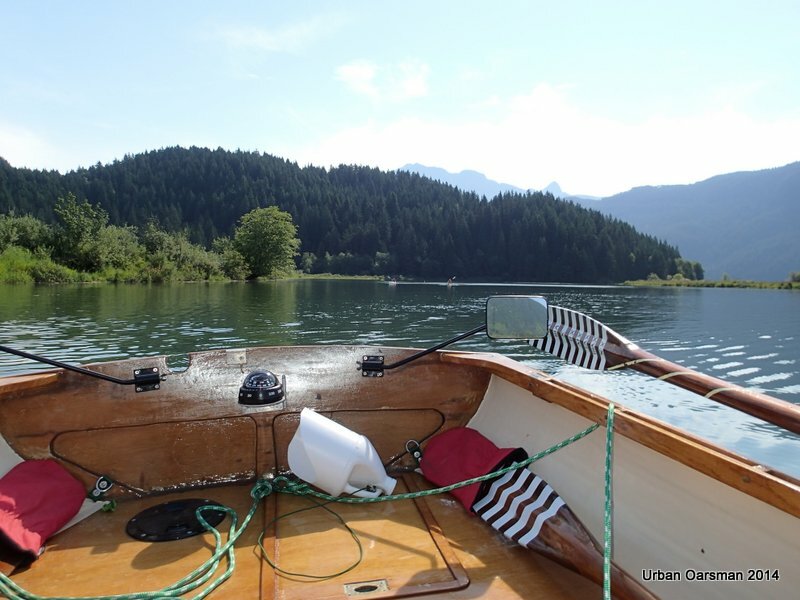 The breeze up river is dying off and I am making better time with my through the water boat speed. I finish off my second liter of water. I am in Chatham Reach. 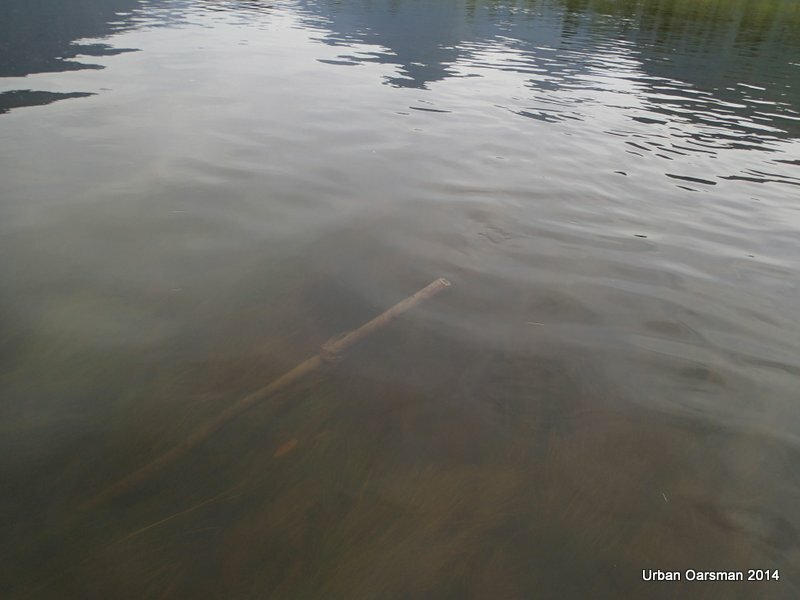 There are a lot of old pilings here. Many of them have vegetation growing on them. 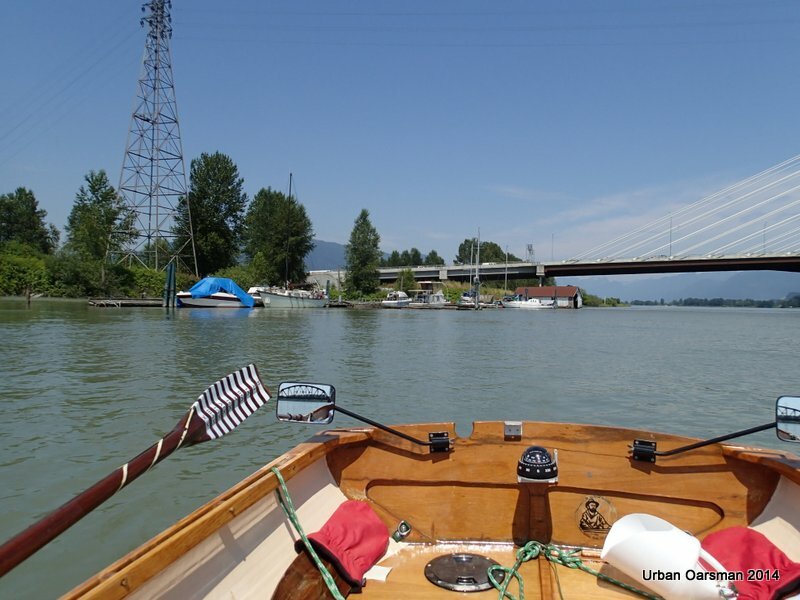 Fourth leg of row, showing Pitt River Marina, Alouette River, Pitt River Bridge and the Railway Bridge. 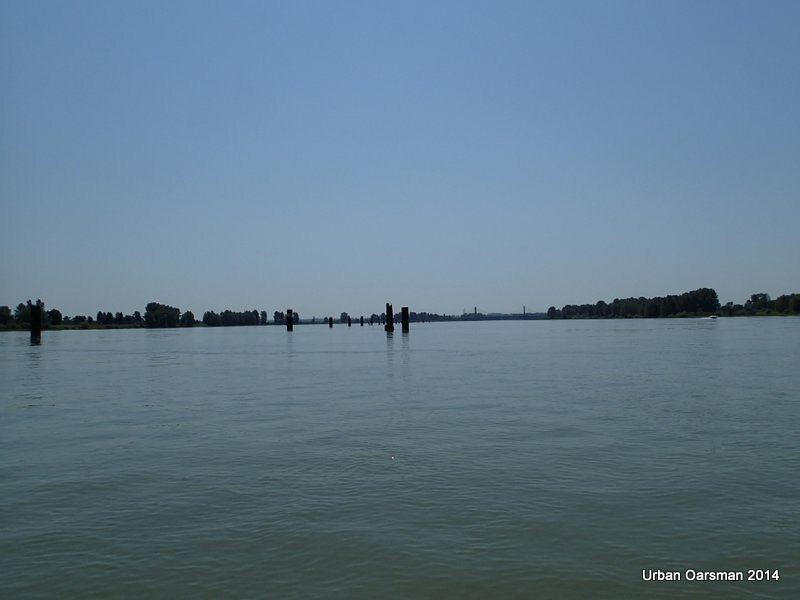 The pilings and dolphins do not show in this image. 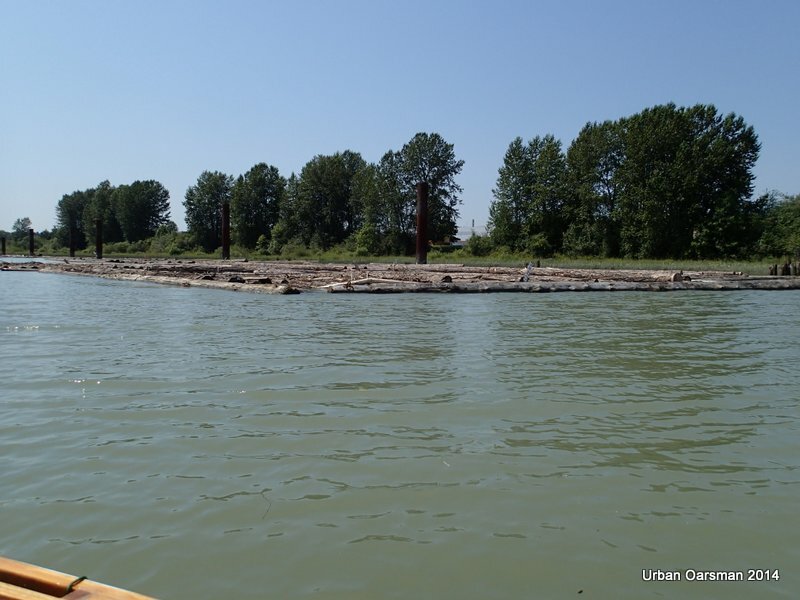 More pilings. 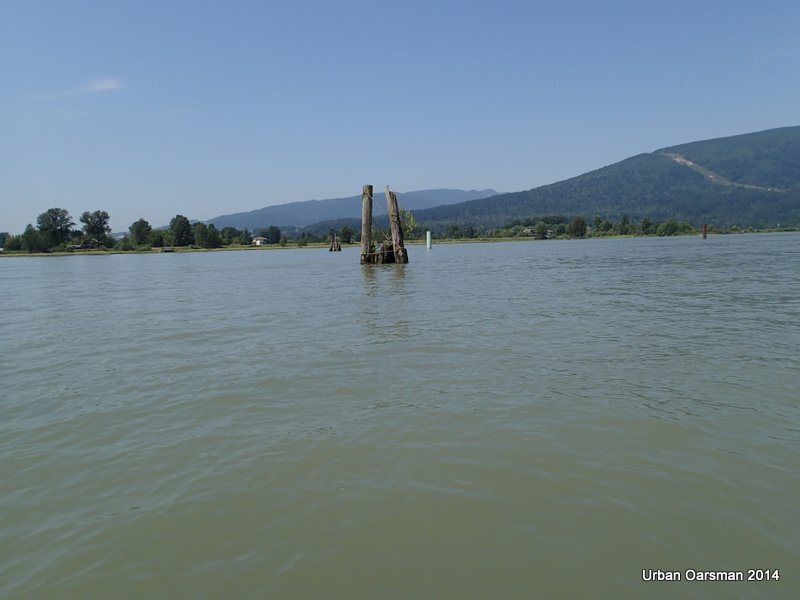 You can see these pilings from the Pitt River Bridge. 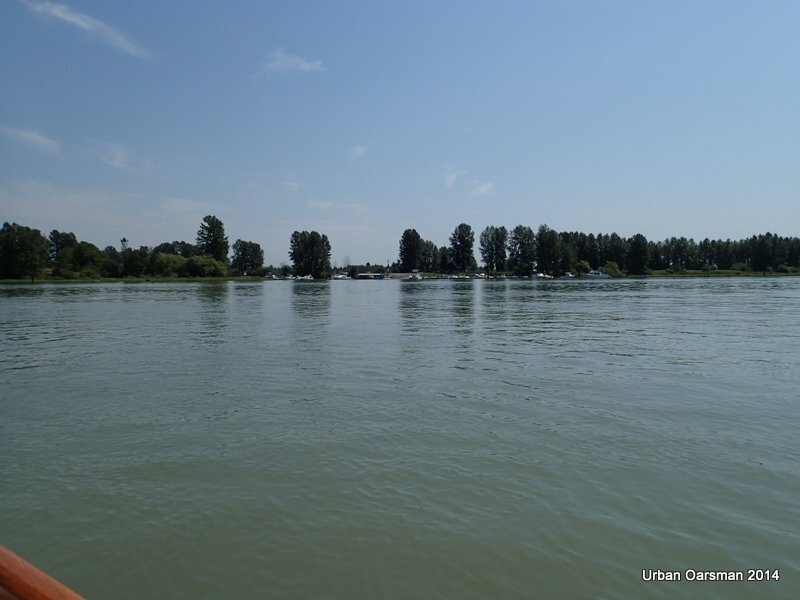 Pitt Meadows Marina in the distance. 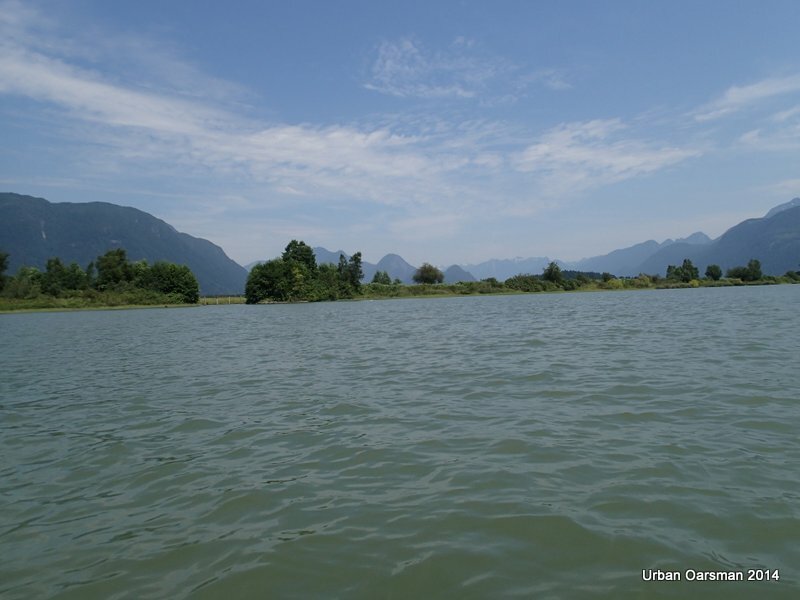 It is on the South-East shore where Alouette River enters the Pitt River. I am in Chatham Reach staying river right. 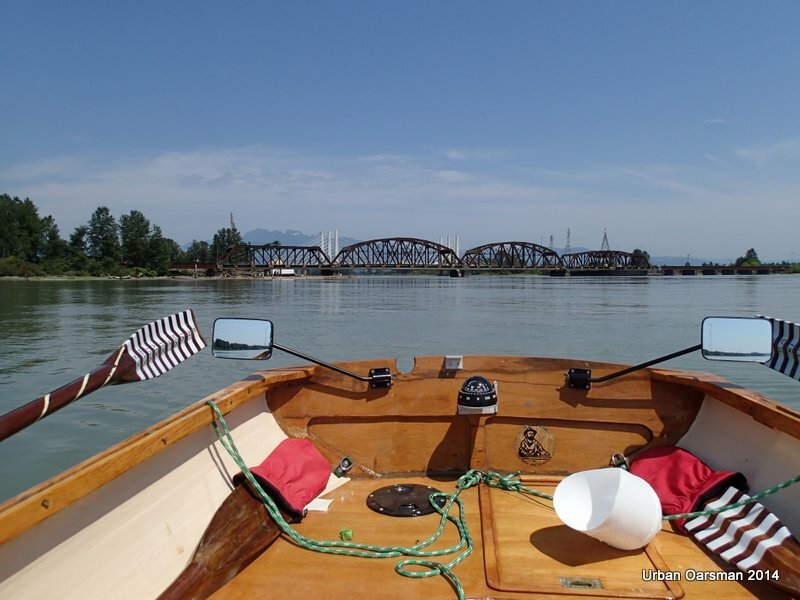 The Pitt River Bridge in the distance. 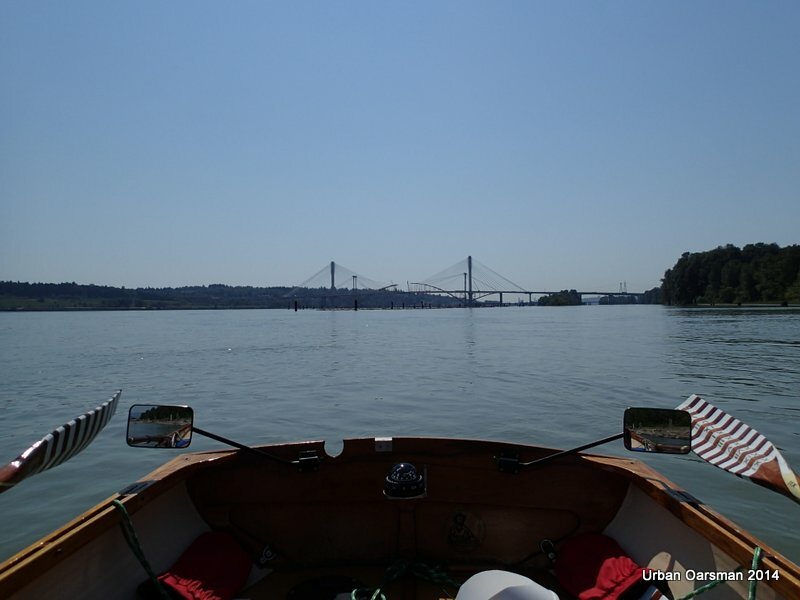 I am rowing backwards for visibility, keeping river right as I pass under the bridge. 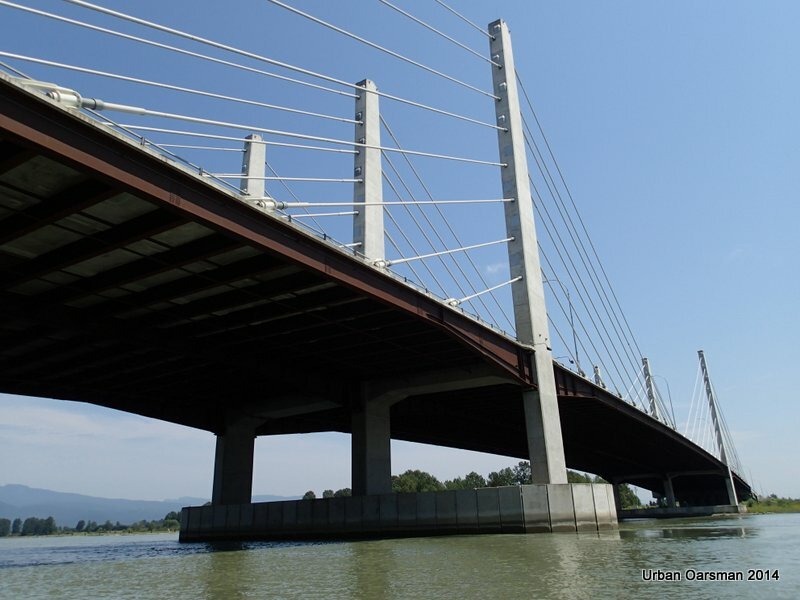 Under the Pitt River Bridge. Current speed is 3 kh/hr. On the South side of the Bridge. 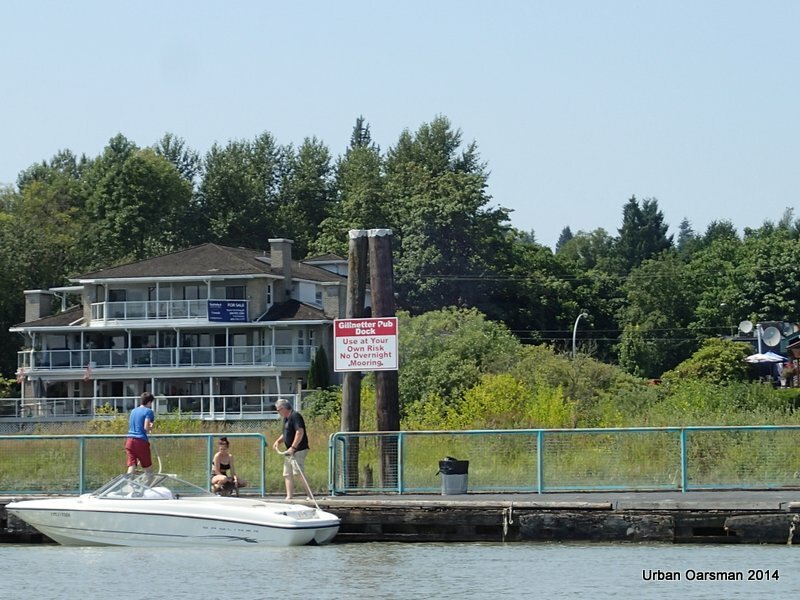 Looking North, up river at the Pitt River Marina. 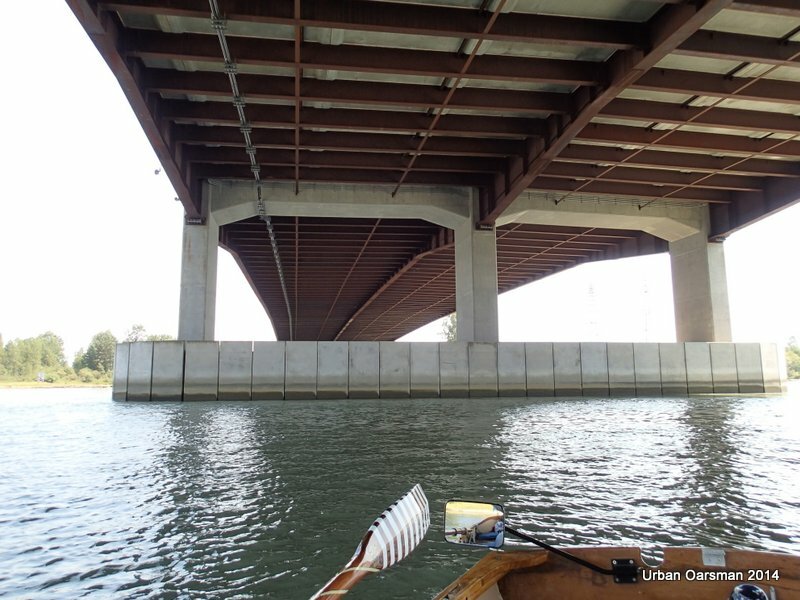 Going under the Railway Bridge. 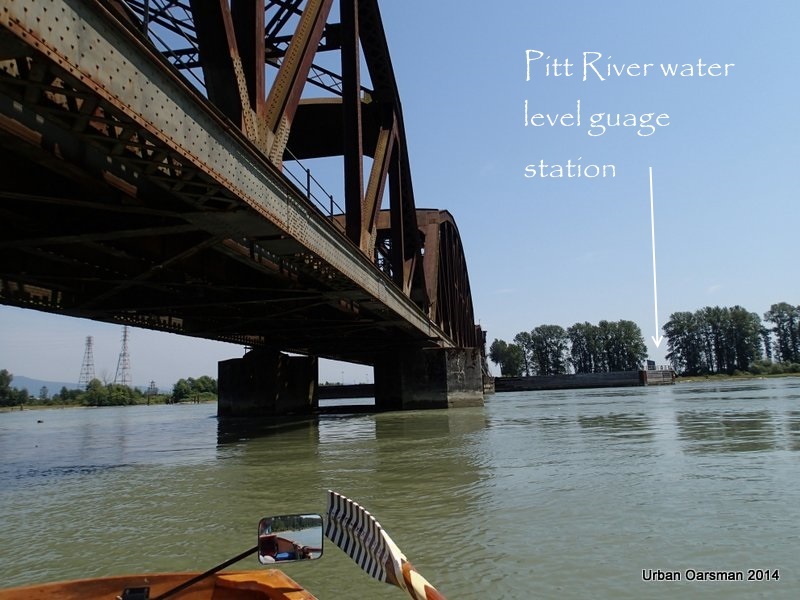 The Pitt River water level gauge is in the long footing in the background on the south end. I am still staying river right. 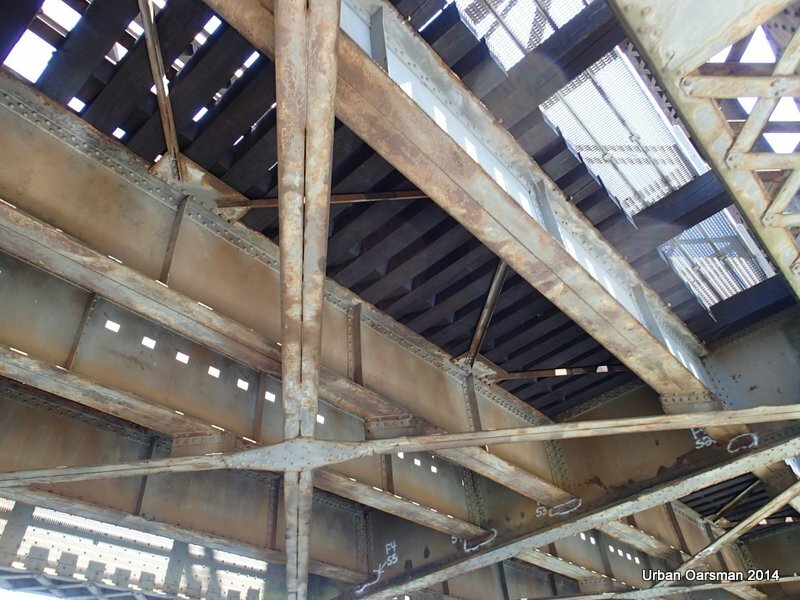 Looking at the underside of the railway bridge. 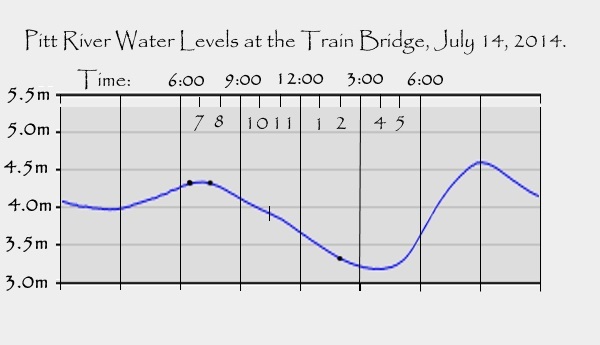 Where the water gauge station is located. Leaving the bridges behind. There is almost 4 km/hr of current and the wind has stopped. It sure is hot with no cooling breeze. I have another iced tea. I brought with me two liters of water and nine 710 ml bottles of iced tea. Only four bottles of the iced tea were in the cooler. Well better warm iced tea that no iced tea. 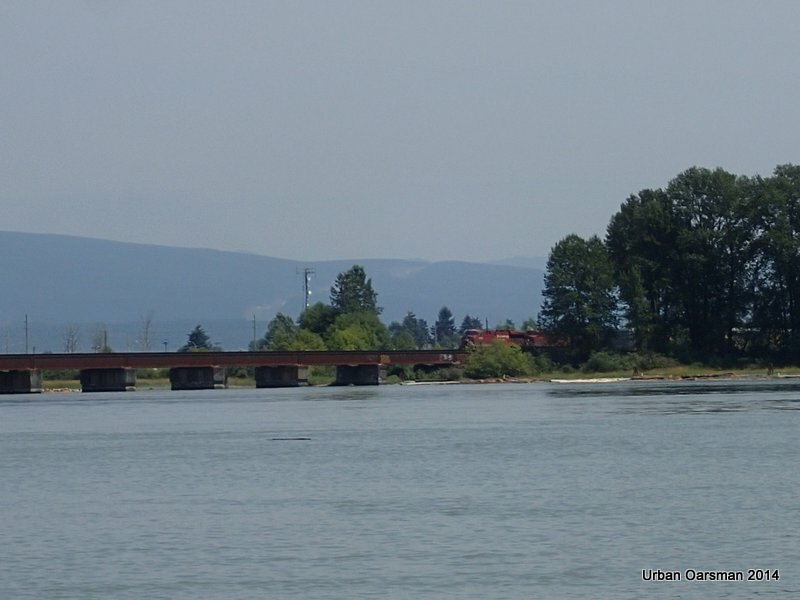 A train starts to cross the railway bridge. Glad that I am not under it now. 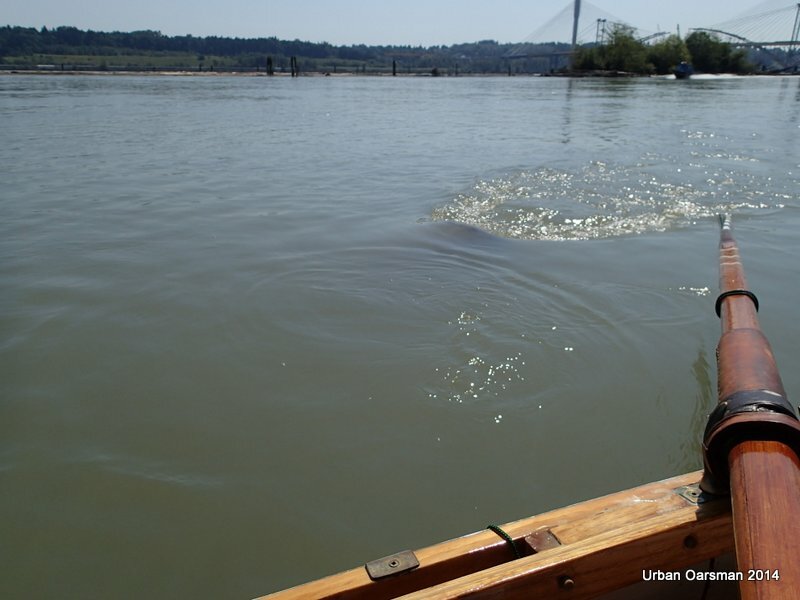 Log booms to river right. I must be careful not to get stuck by the current against them. 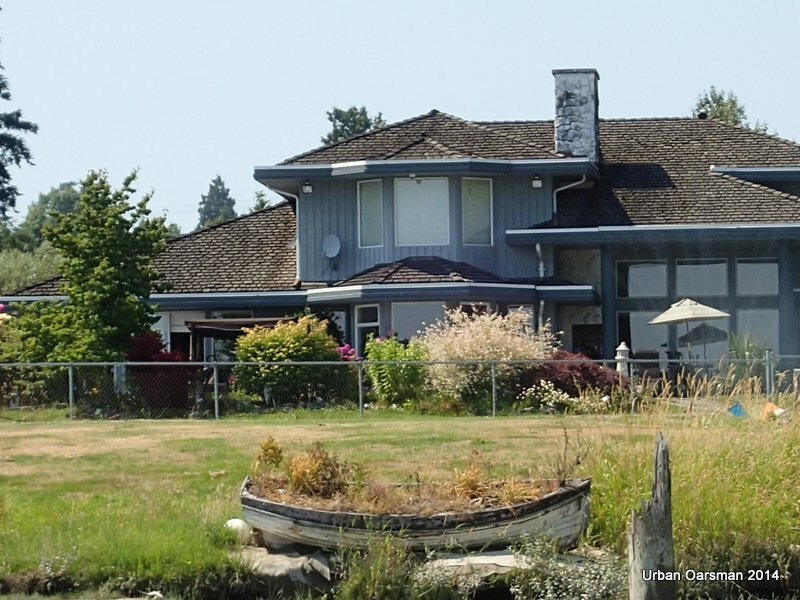 Strange looking building on the East shore. Looks like a traffic-control tower. 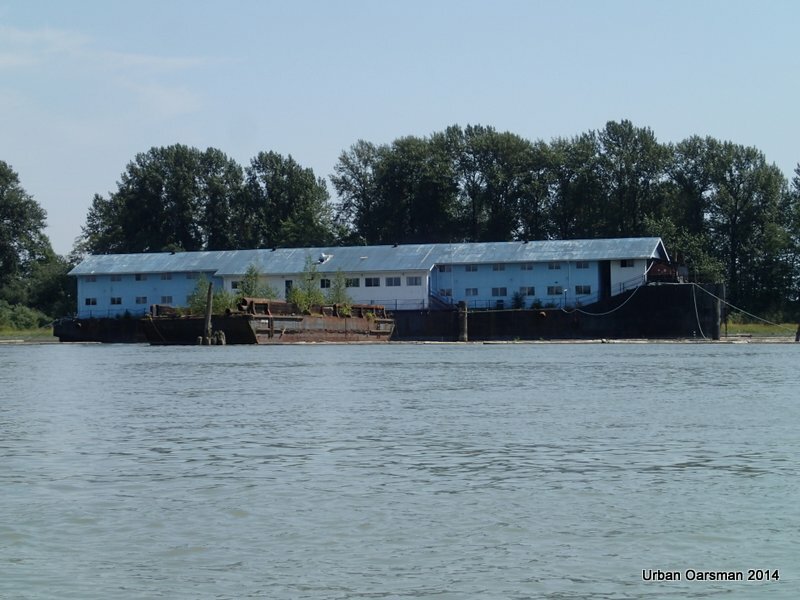 Barges moored to river left. 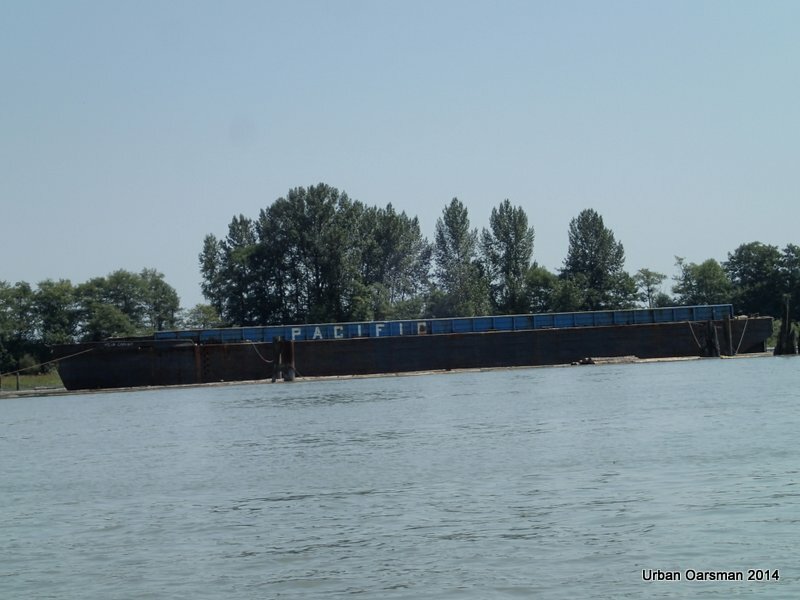 Not all of the barges look derelict. Leaving the “traffic-control” building behind. Passing by the Marina by the Gillnetter Pub. The Gillnetter Pub dock. Next row I will stop here for lunch. 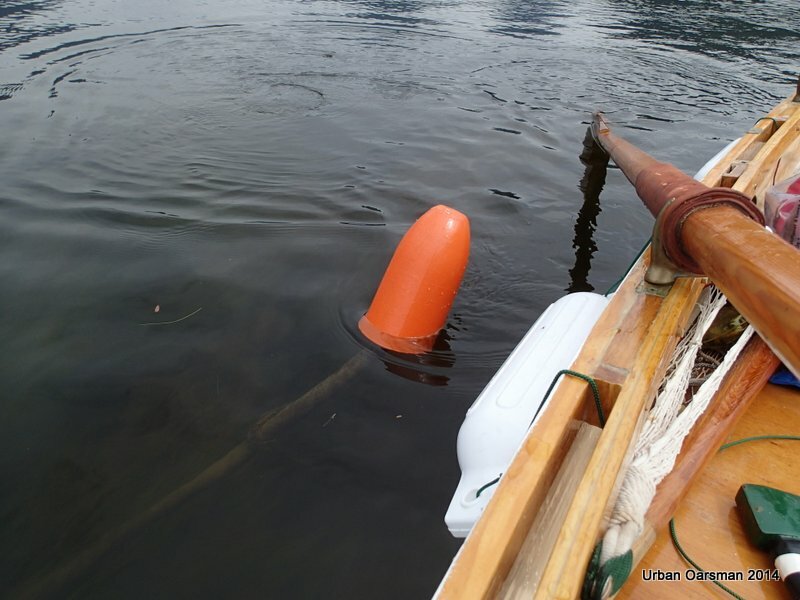 Sad ending for a clinker putt-putt boat. 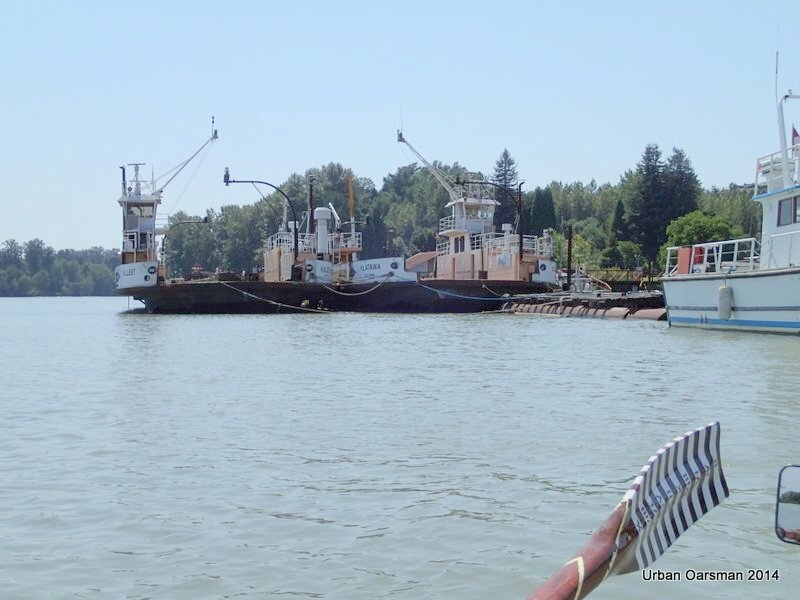 Two mothballed Albion ferries, the Kulleet and the Klatawa at Tidal (Harken)Towing. 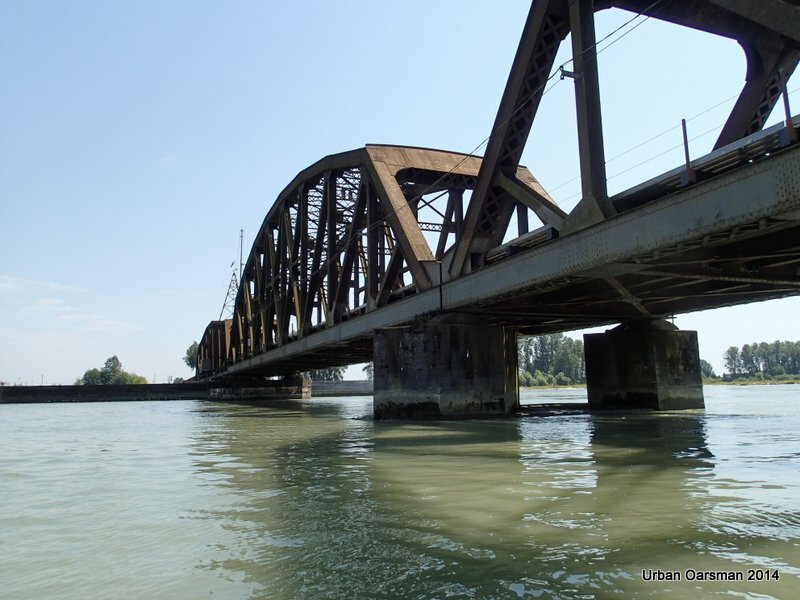 Their route used to be between Albion to Fort Langley. 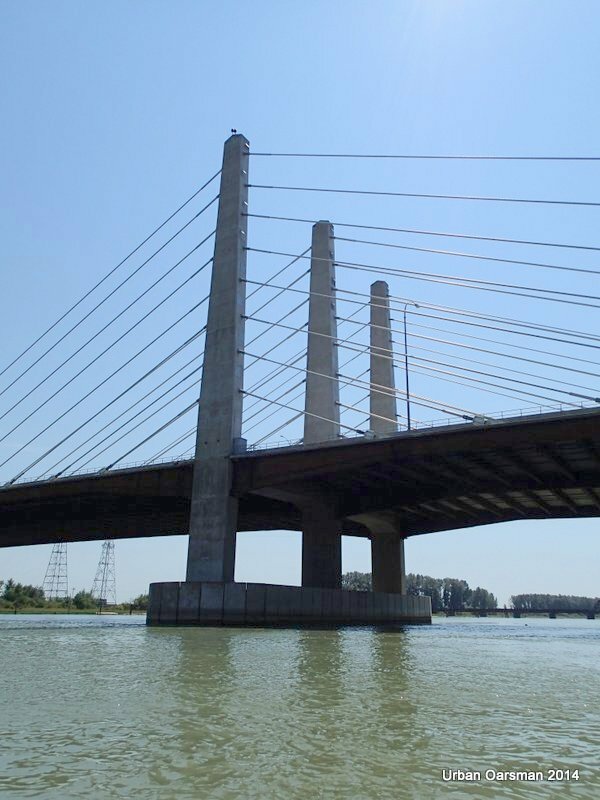 It was discontinued when the Golden Ears Bridge was opened on July 31st, 2009. They were transit ferries. 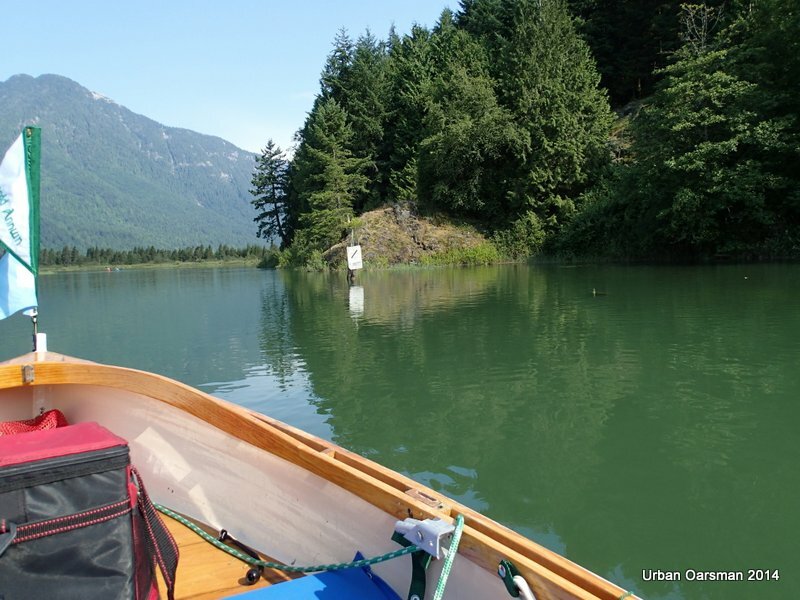 Route: Albion to Fort Langley. Discontinued. Now this is what should happen to old clinker boats. this double-ender is probably getting better treatment than my pampered clinker putt-putt boat, “Snowdrop”. Final leg of the Row. 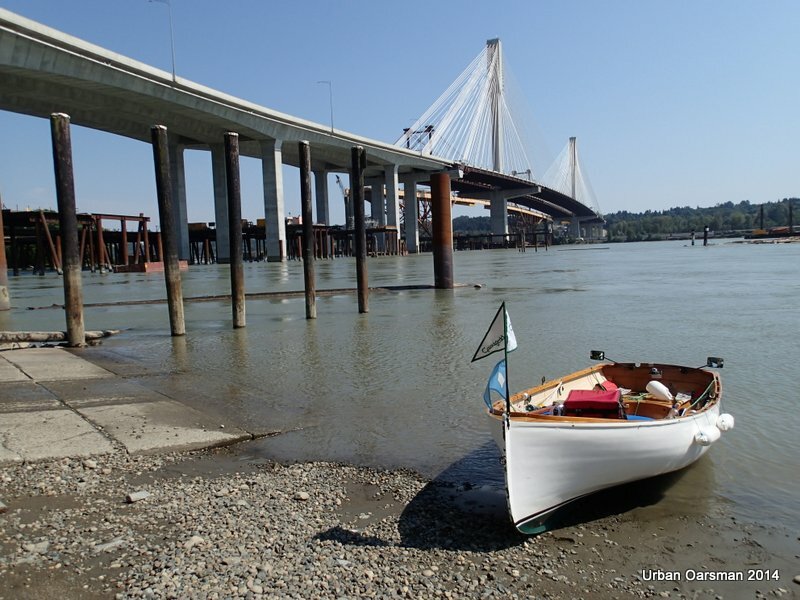 Ending at the Port Mann Bridge Boat Launch at Maquabeak Park. 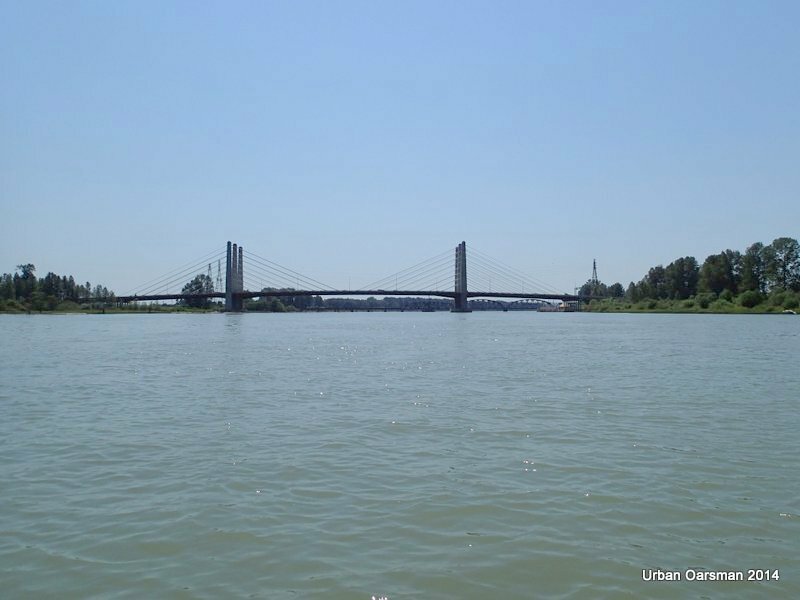 The Pitt enters the Fraser River. The current was flowing at 8 km/hr at the point. The walkway out from Traboulay Po Co trail, South of Argue Street. 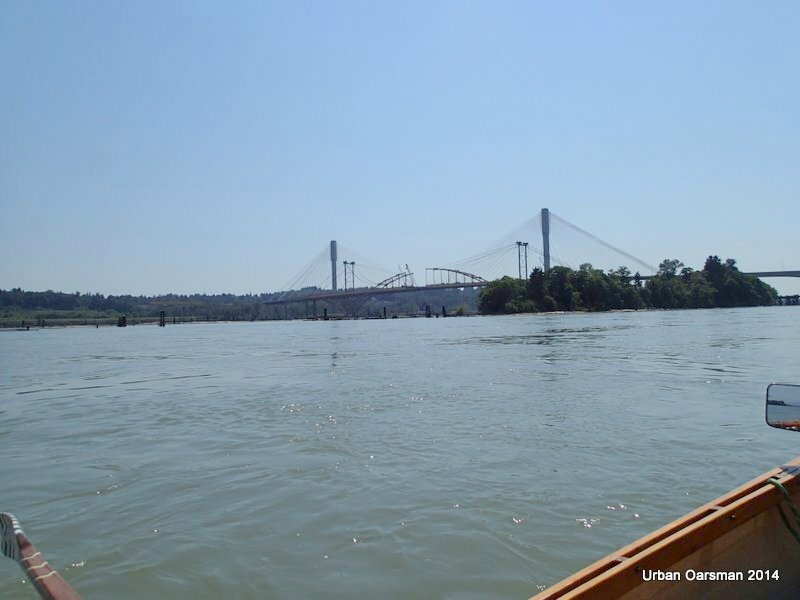 The new and old Port Mann Bridges. 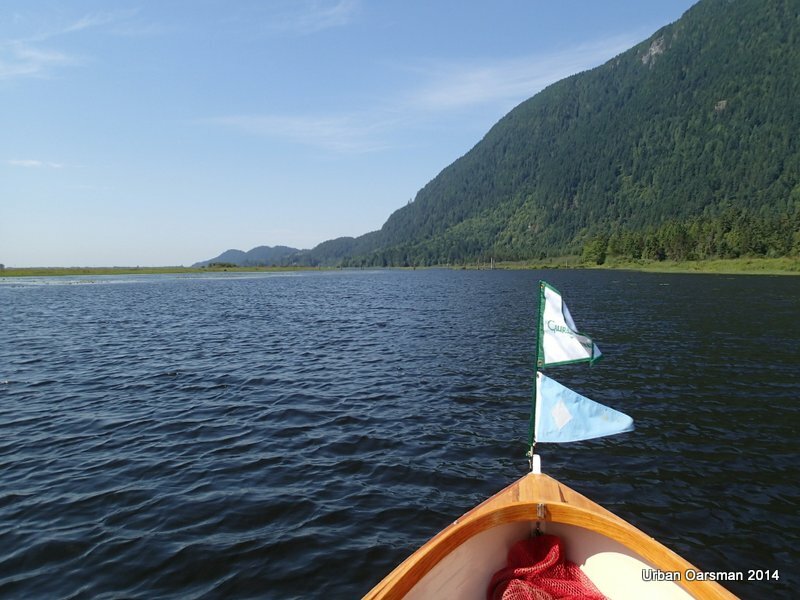 I am rowing backwards here as there are many logs stuck in the mud near the Fraser’s shore. 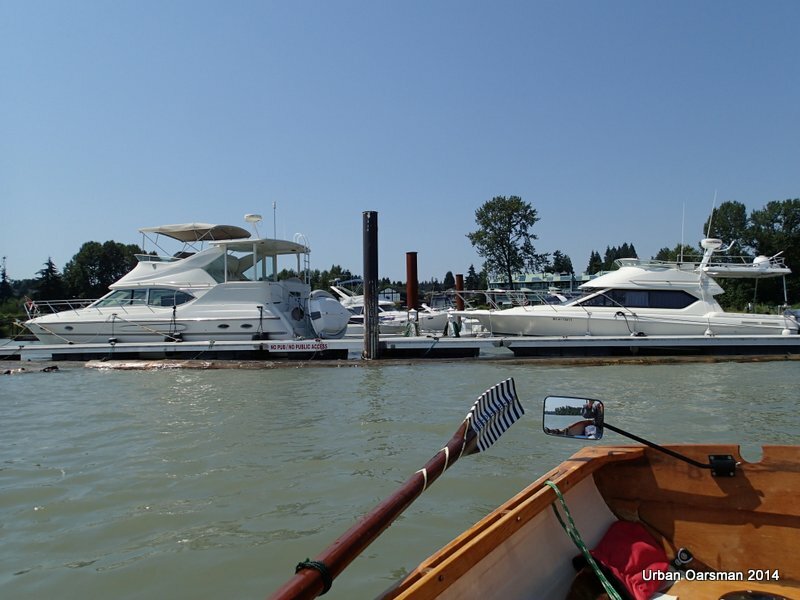 I have to keep to river right so I do not get taken past the boat launch by the current. 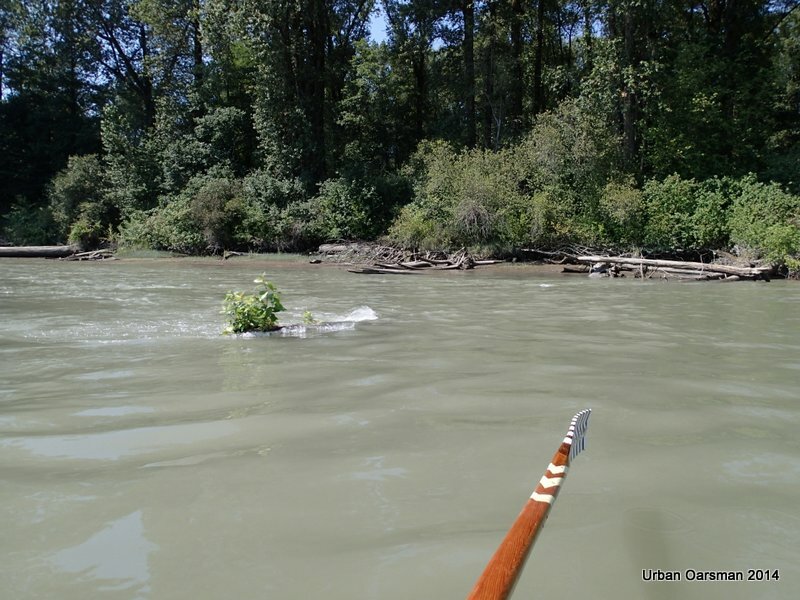 The current is running at 8 km/hr as I pass this still-growing tree. 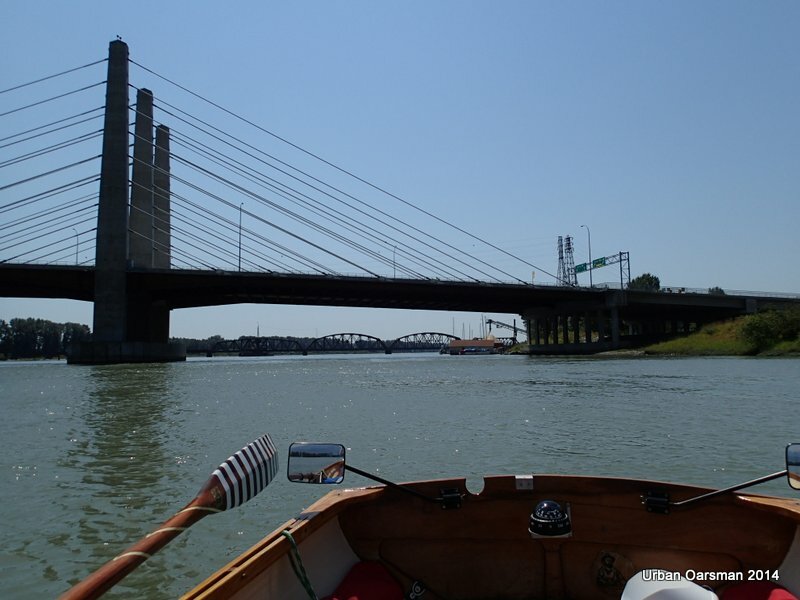 View of the two bridges as I pass by Tree Island. The bridge removal guys have built a bridge to the old Port Mann Bridge footings. It is being used to remove the old bridge structure. Another view of the temporary bridge structure. It will be nice when all of this stuff is removed. 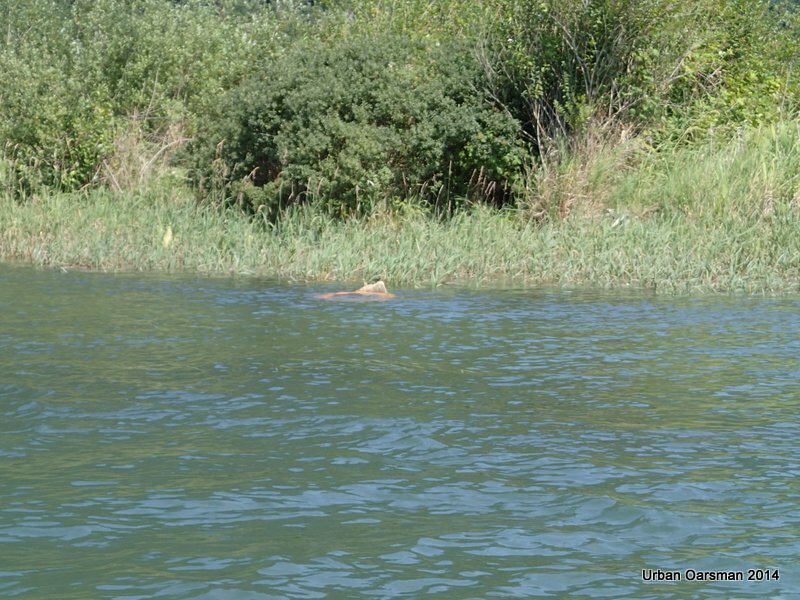 It is cluttering up the river here. 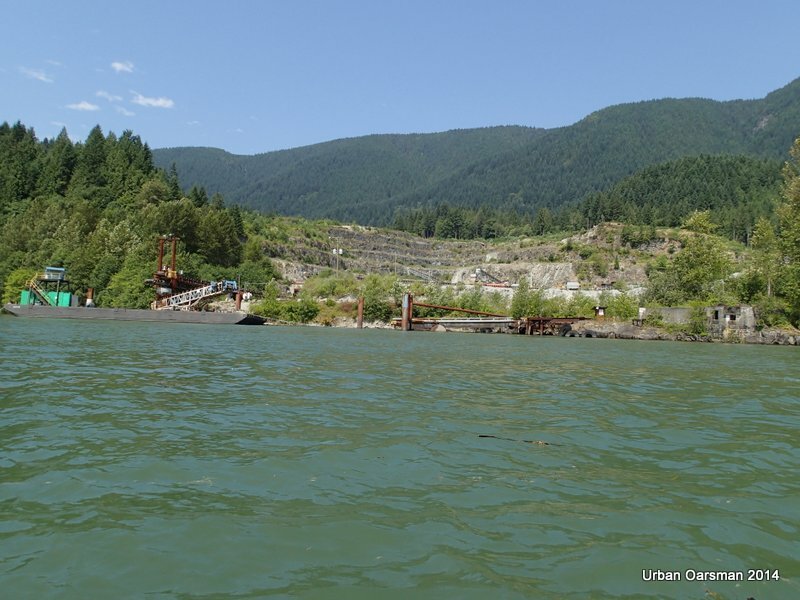 It will be nice when the boat launch is put back to normal and not being used as a bridge removal/water main installation site. Gwragedd Annwn at the beach, Maquabeak Park (Port Mann) boat launch. 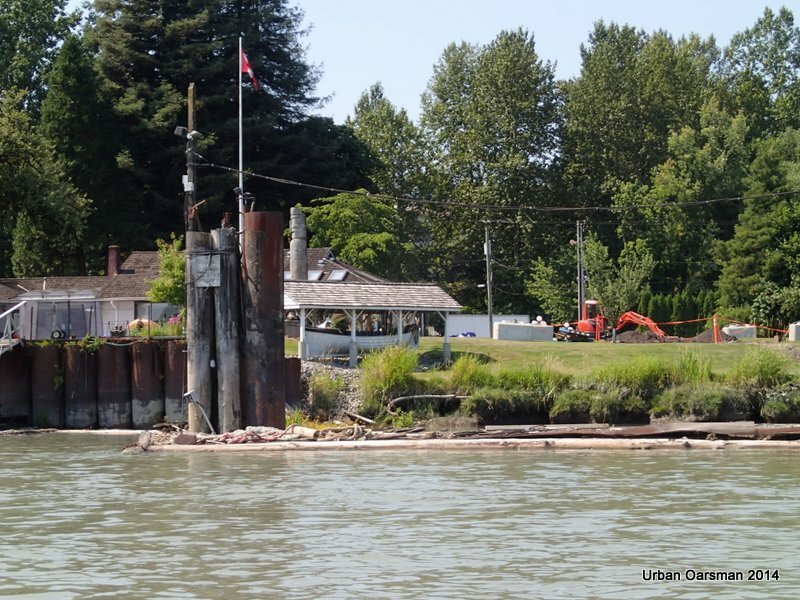 The river current is flowing at 5 km/hr past the pilings in the background. The end of the row. It has been a six hour trip. My son, Paul will be arriving soon to pick Gwragedd Annwn and I up for the trip home.